本发明实施例提供种聚簇存储方法及装置，涉及计算机技术领域，能够在对数据装载性能和数据更新性能影响较小的同时，提高数据查询性能和数据压缩效率。 Embodiment of the present invention provides a method and kinds of clustered storage means relates to the field of computer technology, it is possible to load data and performance data update performance less effect while improving data compression efficiency of the data and query performance. 该方法包括：将待存储的第数据逐行缓存至数据库系统中的本地内存中；确定第排序列，第排序列用于对本地内存中已缓存的数据进行排序；若本地内存中已缓存的第二数据满足预设条件，则根据第排序列对第二数据进行排序，第二数据为第数据中的已缓存至本地内存中的数据；将排序后的第二数据聚簇存储至数据库系统中的存储介质中。 The method comprising: storing first data to be buffered in a progressive local memory database system; determining a first sort column, sorting the first column in the local memory for the buffered data sorting; if local cached in memory the second data meets a preset condition, the second column to sort the data sort section, the second data into first data to the data cached in the local memory; second sorted data stored in the clustered database system the storage medium. 本发明涉及计算机技术领域，尤其涉及一种聚簇存储方法及装置。  The present invention relates to computer technologies, and particularly to a method and apparatus for storing cluster together. 现有技术中，采用堆表在存储介质中存储数据时，由于每行数据均是按照数据插入的自然顺序无序存储的，因此，对数据装载性能和数据更新性能影响较小。 When  the prior art, using data stored in a storage medium heap table, since each line of data is inserted according to the data stored in the natural order disordered, therefore, has little effect on the load data and performance data update performance. 进一步地，采用堆表在存储介质中存储数据后，若需在该堆表的数据中查询某个数据，则需从堆表的第一行开始逐行进行对比，直到查找到该某个数据。 Further, after using the stack data stored in the table storage medium, a data query in the data For the stack table, need to be compared from the stack row first row of the table, until the certain data to look . 然而，采用堆表在存储介质中存储数据时，由于数据为无序存储的，且在堆表中查询数据时，需从堆表的第一行开始逐行进行对比，因此，虽然对数据装载性能和数据更新性能的影响较小，但是数据压缩比和数据查询性能较低。  However, when the stack table using data stored in a storage medium, since data are stored unordered, and the query data, need to be compare from the first row in the row table heap stack table, and therefore, although less impact on the performance of data loading and updating performance data, but the data compression ratio and data query performance is low. 本发明的实施例提供一种聚簇存储方法及装置，能够在对数据装载性能和数据更新性能影响较小的同时，提高数据查询性能和数据压缩效率。 Example  The present invention provides a method and apparatus for storing clustering, it is possible to load data and performance data update performance less effect while improving data compression efficiency of the data and query performance. 将排序后的所述第二数据聚簇存储至所述数据库系统中的存储介质中。  The sorted cluster data stored in the second database system the storage medium. 所述预设条件用于表征所述本地内存中已缓存的第二数据的数据量与所述本地内存允许存储的数据量之间的关系。  The condition for a predetermined amount of data characterizing the local cache memory has a second data memory allows the local relationship between the amount of data stored. 若所述第二数据的行数大于或等于所述第一预设阈值，则根据所述第一排序列对所述第二数据进行排序。  If the number of rows of the second data is greater than or equal to the first predetermined threshold value, the second column of the data is sorted according to the first ordering. 若所述第二数据占用所述本地内存的大小大于或等于所述第二预设阈值，则根据所述第一排序列对所述第二数据进行排序。  If the second data occupying the local memory size is greater than or equal to the second predetermined threshold value, according to the first column of the second sorting sorts the data. 根据所述第一排序列的数值大小或所述第一排序列的数值的哈希值大小对所述第二数据进行排序。  a hash value or size of the numerical values ​​of the first column of the sorted column of data values ​​of the second sorting according to the first ordering. 将排序后的所述第二数据聚簇存储至所述存储介质中的空闲物理块中，所述空闲物理块为除第三数据占用的物理块之外的物理块，所述第三数据为所述第一数据中在所述第二数据之前已聚簇存储至所述存储介质中的数据。  The sorted cluster storing the second data storage medium to the free physical block, the spare physical block as a physical block other than the third physical block occupied by the data of the first third data of the first data before the second data has been stored clustering data to the storage medium. 所述第一排序列包括物理列和表达式中的至少一个。  sorting the first column includes a physical column and at least one of expressions. 若所述查询列为所述第一排序列中的第一个排序列，则根据所述第一个排序列， 对所述第一数据进行查询操作。  When the sorting of the query as a first column of the first row of sorting, the sorting according to said first column, the first query operation data. 根据所述第一个排序列，在所述本地内存中采用二分查找方式对所述第一数据的一个或多个数据页中的每个数据页进行查询操作。  According to the first sorting column, using a binary search mode in the local memory of the first data to a data page or more data pages for each query. 若所述第二排序列为所述第一排序列中的第一个排序列，则根据所述第一个排序列，对所述第一数据进行排序操作。  If the second sorting as a first sorting the first column of the sorted column, the column according to the first sort, the sorting operation for the first data. 根据所述第一个排序列，在所述本地内存中对所述第一数据进行归并排序。  The sorting of the first column a, merge sort for the first data in the local memory. 若所述聚合列为所述第一排序列中的第一个排序列，则根据所述第一个排序列， 对所述第一数据进行聚合操作，所述聚合操作为在所述第一数据中查找最大值或最小值的操作。  When the polymerization is listed as the first column of the first sort sorted column, the column according to the first sort, the first operation data polymerization, the polymerization operation as the said first data is the maximum or minimum lookup operation. 依次比较所述每个数据页中的最大值或最小值，以确定所述第一数据中的最大值或最小值。  sequentially comparing each of said maximum or minimum in the data page, to determine the maximum or minimum value of said first data. 将排序后的所述第二数据逐行插入所述数据表中，以将排序后的所述第二数据聚簇存储至所述存储介质中。  The sorted data into said second data table row, the sorted to the second data stored in the cluster storage medium. 存储单元，用于将所述操作单元排序后的所述第二数据聚簇存储至所述数据库系统中的存储介质中。  The storage unit for the sorting after the second operation unit to store the data for a clustered database system storage medium. 其中，所述操作单元，具体用于若所述第二数据的行数大于或等于所述第一预设阈值，则根据所述第一排序列对所述第二数据进行排序。  wherein the operation unit, specifically the number of lines if the second data is greater than or equal to the first predetermined threshold value, the second column of the data is sorted according to the first ordering. 其中，所述操作单元，具体用于若所述第二数据占用所述本地内存的大小大于或等于所述第二预设阈值，则根据所述第一排序列对所述第二数据进行排序。  wherein the operation unit is specifically configured to, if the second data occupying the local memory size is greater than or equal to the second predetermined threshold value, according to the first column of the second ordering sort the data. 所述操作单元，具体用于根据所述确定单元确定的所述第一排序列的数值大小或所述第一排序列的数值的哈希值大小对所述第二数据进行排序。  The operation unit, specifically for sorting the data according to the second hash value determination unit determines the magnitude of the numerical values ​​of the first row or the first sort sort column values. 所述存储单元，具体用于将所述操作单元排序后的所述第二数据聚簇存储至所述存储介质中的空闲物理块中，所述空闲物理块为除第三数据占用的物理块之外的物理块， 所述第三数据为所述第一数据中在所述第二数据之前已聚簇存储至所述存储介质中的数据。  The storage unit, particularly for the sorting after the second operation unit to store the data for a clustered storage medium free physical block, the spare physical block except for the third data occupation physical blocks other than the physical block, the third data is the first data already clustered in the second data storage prior to said data storage medium. 所述确定单元确定的所述第一排序列包括物理列和表达式中的至少一个。  The determining unit determines that the first column includes sorting the physical columns and at least one of expressions. 所述操作单元，还用于若所述确定单元确定的所述查询列为所述第一排序列中的第一个排序列，则根据所述第一个排序列，对所述第一数据进行查询操作。  The operating unit is further configured to, if the determination unit determines the query as a first column of said first sort sorted column, the column according to the first sort, the The first data query operation. 其中，所述操作单元，具体用于根据所述第一个排序列，在所述本地内存中采用二分查找方式对所述缓存单元缓存的所述第一数据的一个或多个数据页中的每个数据页进行查询操作。  wherein the operating unit, particularly for a cached in the cache unit to said first data or more data sorting according to said first column, using a binary search mode in said local memory each data page page query operation. 所述操作单元，还用于若所述确定单元确定的所述第二排序列为所述第一排序列中的第一个排序列，则根据所述第一个排序列，对所述第一数据进行排序操作。  The operating unit is further configured to, if the determination unit determines the second ordering of the sorting as a first sorting the first column in the column, the column based on the first sort of said first data sorting operation. 其中，所述操作单元，具体用于根据所述第一个排序列，在所述本地内存中对所述缓存单元缓存的所述第一数据进行归并排序。  wherein the operation unit, specifically for sorting according to said first column, a merge sort buffer in the cache unit of the first data in said local memory. 所述操作单元，还用于若所述确定单元确定的所述聚合列为所述第一排序列中的第一个排序列，则根据所述第一个排序列，对所述第一数据进行聚合操作，所述聚合操作为在所述第一数据中查找最大值或最小值的操作。  The operating unit is further configured to, if the determination unit determines the first polymerization as a sort column of the first sort column, the column according to the first sort, the the first operation data polymerization, the polymerization operation is to find the maximum or minimum in the first operation data. 其中，所述操作单元，具体用于根据所述第一个排序列，在所述本地内存中确定所述缓存单元缓存的所述第一数据的一个或多个数据页中的每个数据页中的最大值或最小值，并依次比较所述每个数据页中的最大值或最小值，以确定所述第一数据中的最大值或最小值。  wherein the operation unit, specifically for sorting according to said first column, said buffer unit to determine a first data buffer or more pages of data in each of said local memory data pages maximum or minimum, and sequentially comparing each of said maximum or minimum in the data page, to determine the maximum or minimum value of said first data. 其中，所述操作单元，具体用于将排序后的所述第二数据逐行插入所述创建单元创建的所述数据表中，以将排序后的所述第二数据聚簇存储至所述存储介质中。  wherein the operating unit, particularly for the second sorted data creation unit creates the progressive insertion of said data table, to the sorted data of the second cluster storage to the storage medium. 将待存储的第一数据逐行缓存至所述内存中，并确定第一排序列，且若所述内存中已缓存的第二数据满足预设条件，则根据所述第一排序列对所述第二数据进行排序，以及将排序后的所述第二数据聚簇存储至所述底层存储介质中，所述第一排序列用于对所述内存中已缓存的数据进行排序，所述第二数据为所述第一数据中的已缓存至所述内存中的数据。  The first data to be stored into the cache memory line by line, and determining a first sort column, and if the cache memory has a second data meets a preset condition, then the first sorted the second column of data are sorted, the sorted and second data stored in the underlying clustered storage medium, the first column is used for sorting the sort data buffered in memory , the first data is cached in the memory to the data of said second data. 所述预设条件用于表征所述内存中已缓存的第二数据的数据量与所述内存允许存储的数据量之间的关系。  The preset condition for characterizing the amount of data buffered in the second memory with the data memory allows the relationship between the amount of data stored. 其中，所述处理器，具体用于若所述第二数据的行数大于或等于所述第一预设阈值，则根据所述第一排序列对所述第二数据进行排序。  wherein the processor, particularly if the number of lines of the second data is greater than or equal to the first predetermined threshold value, the second column of the data is sorted according to the first ordering. 其中，所述处理器，具体用于若所述第二数据占用所述内存的大小大于或等于所述第二预设阈值，则根据所述第一排序列对所述第二数据进行排序。  wherein the processor, particularly if the second data to the memory occupancy size is larger than or equal to the second predetermined threshold value, the second data according to the first sort column put in order. 所述处理器，具体用于根据所述第一排序列的数值大小或所述第一排序列的数值的哈希值大小对所述第二数据进行排序。  The processor, particularly for sorting the data according to the second hash value of the size of numerical size of the first row or the first sorting sort column values. 所述处理器，具体用于将所述第二数据聚簇存储至所述底层存储介质中的空闲物理块中，所述空闲物理块为除第三数据占用的物理块之外的物理块，所述第三数据为所述第一数据中在所述第二数据之前已聚簇存储至所述底层存储介质中的数据。  The processor, particularly for the second data stored in the underlying clustered storage medium free physical block, the spare physical block except for the physical block in the third data occupies physical block, the third data is the first data already clustered in the second data storage prior to the underlying data storage medium. 所述处理器确定的所述第一排序列包括物理列和表达式中的至少一个。  the processor determines the first column includes sorting the physical columns and at least one of expressions. 所述处理器，还用于在将所述第一数据全部存储至所述底层存储介质中之后，确定查询列，且若所述查询列为所述第一排序列中的第一个排序列，则根据所述第一个排序列，对所述第一数据进行查询操作。 After  the processor is further configured to store the first data to all of the underlying storage medium, determining a query row, and if the query as the first column of the first ordering sort column, the column according to the first sort, the first query operation data. 所述处理器，还用于在确定所述查询列之后，根据所述第一个排序列，对所述第一数据进行查询操作之前，将所述底层存储介质中存储的所述第一数据读入所述内存中，并根据所述第一个排序列，在所述内存中采用二分查找方式对所述第一数据的一个或多个数据页中的每个数据页进行查询操作。 Before  The processor is further configured to, after determining that the query column, a sorting according to said first column, the first query operation data, to the underlying storage in a storage medium the first data is read into the memory, and a sorting based on the first column, using a binary search for each page of data to the first embodiment a plurality of data pages or data in the query in memory operating. 所述处理器，还用于在将所述第一数据全部存储至所述底层存储介质中之后，确定第二排序列，且若所述第二排序列为所述第一排序列中的第一个排序列，则根据所述第一个排序列，对所述第一数据进行排序操作。 After  the processor is further configured to store the first data to all of the underlying storage medium, determining a second sort column, and if the second ordering as the first sort column the first sort column, the column according to the first sort, the sorting operation for the first data. 所述处理器，还用于在确定所述第二排序列之后，根据所述第一个排序列，对所述第一数据进行排序操作之前，将所述底层存储介质中存储的所述第一数据读入所述内存中，并根据所述第一个排序列，在所述内存中对所述第一数据进行归并排序。  The processor is further configured to prior to the second sort column after determining, based on the first column of a sort, the sorting operation of the first data, the storage medium stored in the underlying the data is read into the first memory, and a sorting based on the first column, a merge sort of data in said first memory. 结合前述的第三方面或第三方面的第一种可能的实现方式至第六种可能的实现方式中的任一种实现方式，在第十一种可能的实现方式中，所述处理器，还用于在将所述第一数据全部存储至所述底层存储介质中之后，确定聚合列，且若所述聚合列为所述第一排序列中的第一个排序列，则根据所述第一个排序列，对所述第一数据进行聚合操作，所述聚合操作为在所述第一数据中查找最大值或最小值的操作。  combination with the aforementioned third aspect or the first possible implementation of the third aspect according to any possible implementation of the sixth one implementation, the eleventh possible implementation manner, the after the processor is further configured to store the first data to all of the underlying storage medium, the polymerization column is determined, and if the polymerization is listed as the first column of the first sort sorted column, then sorting according to said first column of said first data polymerization operation, the polymerization is operative to find the maximum or minimum in the operation of the first data. 所述处理器，还用于在确定所述聚合列之后，根据所述第一个排序列，对所述第一数据进行聚合操作之前，将所述底层存储介质中存储的所述第一数据读入所述内存中，并根据所述第一个排序列，在所述内存中确定所述第一数据的一个或多个数据页中的每个数据页中的最大值或最小值，并依次比较所述每个数据页中的最大值或最小值，以确定所述第一数据中的最大值或最小值。 Before  The processor is further configured to determine, after it said polymerization column, a sorting according to said first column of said first data aggregation operation, the bottom layer of the storage medium stored in the first data is read into the memory, and a sorting based on the first column, to determine a maximum value of said first data or more pages of data in each data page in the memory or minimum values, and sequentially comparing each of said maximum or minimum in the data page, to determine the maximum or minimum value of said first data. 所述处理器，还用于在将待存储的第一数据逐行缓存至所述内存中之前，在所述底层存储介质中创建数据表，并将排序后的所述第二数据逐行插入所述数据表中，以将排序后的所述第二数据聚簇存储至所述底层存储介质中，所述数据表用于装载所述第一数据。  The processor is further configured to be stored in the first data row to the previous cache memory, data tables created in the underlying storage medium, the second data after sorting and the data table row inserted in the sorted to the second data stored in the underlying clustered storage medium, the data table for loading said first data. 本发明实施例提供一种聚簇存储方法及装置，通过将待存储的第一数据逐行缓存至数据库系统中的本地内存中，并确定第一排序列，该第一排序列用于对本地内存中已缓存的数据进行排序，且若本地内存中已缓存的第二数据满足预设条件，则根据该第一排序列对该第二数据进行排序，该第二数据为该第一数据中的已缓存至本地内存中的数据，以及将排序后的该第二数据聚簇存储至数据库系统中的存储介质中。  The present invention provides a method and apparatus clustered storage, to be stored by the first data row to the database cache in the local memory system, and determining a first sort column, sorting the first column with a in the local memory of the buffered data is sorted, and the local memory when the second data buffered meets a preset condition, then sorted according to the sorting of the first column of the second data, the second data for the second a data cached to the data in the local memory, the second and the sorted data clustered database system stored in the storage medium. 通过该方案，在将待存储的第一数据逐行缓存至本地内存的过程中，当在本地内存中已缓存的第二数据的数据量超出本地内存允许存储的数据量时，开始根据确定的第一排序列，对该第二数据进行排序， 以及将排序后的该第二数据存入数据库系统中的存储介质中，由于可对待存储的数据一部分一部分进行排序并存储，以完成数据的装载，因此，可以保证数据库系统中的存储介质中的数据局部有序，从而能够保证在对数据装载性能和数据更新性能影响较小的同时，提高数据查询性能和数据压缩效率。 By this embodiment, the process to be stored in the first data row to the local buffer memory when the amount of data buffered in the local memory of the local memory of the second data exceeds the allowable amount of data storage, in accordance with the determined start a first sorted column, the second sort data, the second and the sorted data into the database system, storage medium, since the data to be stored can be sorted and a portion of memory to complete loading data data, therefore, the database system can ensure storage medium local order, thereby ensuring the performance of the data loading and data updating performance less effect while improving data compression efficiency of the data and query performance. 为了更清楚地说明本发明实施例或现有技术中的技术方案，下面将对实施例或现有技术描述中所需要使用的表格和附图作简单地介绍，显而易见地，下面描述中的表格和附图仅仅是本发明的一些实施例，即本发明提供的表格和附图包括但不限于下面描述中的表格和附图。  In order to more clearly illustrate the technical solutions in the embodiments or the prior art embodiment of the present invention, the following table will embodiments described embodiments or the prior art needed to be used in the drawings and are briefly introduced hereinafter, described below the tables and figures are merely some embodiments of the present invention, i.e., the present invention provides tables and figures include but are not limited to the following description of the tables and figures. 图9为本发明实施例提供的对数据进行聚簇存储的示意图二。  Figure 9 a schematic view of the embodiment of the clustered data storage provided by two of the present invention. 本发明提供的聚簇存储方法，根据聚簇存储的思想，在将数据存入数据库系统中的存储介质中时，仅保证每次存入存储介质的数据有序(数据局部有序），并不考虑存入存储介质中的所有数据有序(数据全局有序），因此，采用本发明提供的聚簇存储方法，由于存储介质中的同类数据都是经过局部排序后存储的，因此与现有技术中采用堆表在存储介质中存储的数据为无序存储的情况相比，能够保证在对数据装载性能和数据更新性能影响较小的同时，提高数据查询性能和数据压缩效率。  Clustered storage method of the present invention provides, according to the thought of clusters stored in the system data stored in the database storage medium, only to ensure that each ordered data stored in a storage medium (local order data ), does not consider all the data stored in an ordered (a global ordered data) storage medium, therefore, the use of cluster storage method provided by the present invention, since the same data storage medium are sorted after local storage, Thus using the prior art stack table data stored in the storage medium is compared with disorderly storage, to ensure the performance of the data loading and data updating performance less effect while improving data compression efficiency of the data and query performance . 具体的，采用本发明实施例提供的聚簇存储方法，一方面，由于数据库系统中的存储介质中的同类数据都是经过局部排序后存储的，因此数据存储后，数据查询性能和数据压缩效率较高；一方面，在数据存储过程中，进行数据装载时，由于数据是一部分一部分装载的，因此，能够保证对数据装载性能的影响较小；另一方面，在需要对存储介质中的数据进行更新时，由于可直接对存储介质中待更新的数据所处的数据部分进行更新(若为新增，则可直接将新增数据有序存入存储介质）即可，而无需对存储介质中的所有数据进行更新，因此，能够保证对数据更新性能的影响较小。 Specifically, the present invention is a clustered storage method provided in this embodiment, on the one hand, since the same data in the database system it is the storage medium after sorting stored locally, and therefore the data storage, data query performance and data compression efficiency high; on the one hand, in a data storage process, the data is loaded, since a portion of the data is loaded, it is possible to ensure little effect on the performance data loaded; on the other hand, the required data storage medium when updated, since the data portion of the storage medium in which the data to be updated is updated directly (if new, may be ordered directly add data stored in the storage medium) can be, without the need for a storage medium All data is updated, it is possible to ensure little effect on the updated performance data. 即采用本发明提供的聚簇存储方法，能够保证在对数据装载性能和数据更新性能影响较小的同时，提高数据查询性能和数据压缩效率。 I.e., using stored clustering method provided by the invention, to ensure the performance of the data loading and data updating performance less effect while improving data compression efficiency of the data and query performance. 进一步地，本发明提供的聚簇存储方法，由于在数据存储过程中，只需在本地内存中对数据进行排序，而无需在存储介质中对数据进行排序，且本地内存处理数据的速度比存储介质处理数据的速度快很多，因此，采用本发明提供的聚簇存储方法在对数据进行更新时，能够节省时间和系统资源。  Further, clustered storage method provided by the invention, since the data stored in the process, only to sort the data in local memory, without the need to sort the data in the storage medium, and the data processing local memory much faster than the speed of processing data storage medium, therefore, the use of cluster storage method provided by the invention when the data is updated, the system can save time and resources. 下面将结合本发明实施例中的表格和附图，对本发明实施例提供的聚簇存储方法及装置进行清楚、完整地描述，显然，所描述的实施例仅仅是本发明的一部分实施例，而不是全部的实施例。  below in conjunction with the present invention in a table and the accompanying drawings, cluster storage method and apparatus provided by the present invention are clearly and completely described, obviously, the described embodiments are merely part of the invention embodiment cases, but not all embodiments. 其中，本发明实施例提供的聚簇存储方法及装置可以应用于数据库系统中，该数据库系统可以包括聚簇存储装置的硬件实体和数据库环境，聚簇存储装置的硬件实体可以为计算机节点（或称为计算节点），也可以为能够实现本发明实施例提供的聚簇存储方案的其他设备，即本发明实施例提供的聚簇存储方法的执行主体可以为计算机节点或其他设备，下面以该计算机节点为例，对本发明实施例提供的聚簇存储方法及装置进行说明。 Wherein the embodiment of the present invention, the storage cluster to provide method and apparatus may be applied to the database system, the database system may include hardware and database environments physical cluster storage device, the storage device hardware entities cluster node may be a computer (or referred to as computing nodes), or may be another possible embodiment of the present invention clustered storage devices provided in solution, i.e., the execution subject clustered storage method according to an embodiment of the present invention may be a computer or other device node, to the following computer node as an example, embodiments of the present invention will be described clustered storage method and apparatus provides. S101、计算机节点将待存储的第一数据逐行缓存至数据库系统中的本地内存中。  S101, the computer node to be stored first data row to the database system in the cache local memory. 若需将硬盘的文本中存储的数据，即待存储的第一数据存储至数据库系统中的存储介质中，且为了便于以后对该第一数据进行访问，则在该第一数据存储过程中，计算机节点需先对该第一数据进行排序，然后再将排序后的该第一数据存入该存储介质中。  For the text data stored in the hard disk, i.e., to be stored in the first data storage system to the database storage medium, and in order to facilitate future access to the first data is stored in the first data process, the computer must first node of the first data is sorted, and then the first data stored in the storage medium sorted. 计算机节点在将该第一数据存储至该存储介质的过程中，计算机节点首先需要从硬盘将该第一数据读入至数据库系统中的本地内存。 A first computer node storing the data to the storage medium, the computer a first node first requires the data read from the hard disk to the local memory in a database system. 具体的，计算机节点可以从硬盘将该第一数据逐行缓存至该本地内存中。 Specifically, the computer nodes to the local memory may be a hard disk from the first data row cache. S102、计算机节点确定第一排序列，该第一排序列用于对该本地内存中已缓存的数据进行排序。  S102, a first computer node determines the sort column, sorting the first column of the local memory for the buffered data is sorted. 计算机节点在将该第一数据逐行缓存至该本地内存的过程中，计算机节点可确定第一排序列，其中该第一排序列可以是预设的，其中，该第一排序列可用于对该本地内存中已缓存的数据进行排序。 Process  Computer nodes in the first row of data into the local cache memory, the computer a first node may determine the sort column, wherein the first column can be pre-sorting, wherein the first sort column It can be used to sort the local memory data is cached. 可选的，本发明实施例提供的聚簇存储方法中，计算机节点在对第一数据进行排序时，可根据第一排序列的数值大小或第一排序列的数值的哈希值大小对该第一数据进行排序。  Alternatively, clustered storage method according to an embodiment of the present invention, when the first computer node to sort the data, the hash value may be the numerical value according to the size of the first row or the first sort of sort column size of the first data is sorted. 本领域技术人员可以理解，本发明实施例提供的数据库系统中的存储介质可以为磁盘，磁盘可以包括硬盘和软盘。  Those skilled in the art will be appreciated, the storage medium of the database system provided in the embodiment of the present invention may be a disk, the disk may include a hard disk and a floppy disk. 常用的磁盘一般为可移动磁盘，可移动磁盘可以分为两大类:一类为基于芯片存储的USB盘(Universal Serial Bus flash disk，通用串行总线闪存驱动器)或闪盘;另一类为基于硬盘的移动硬盘，其中，可移动磁盘中最主要的为移动硬盘， 而移动硬盘又因硬盘的不同分为笔记本移动硬盘和台式机移动硬盘。 Commonly used generally disk as a removable disk, a removable disk may be divided into two categories: one for the chip-based memory USB stick (Universal Serial Bus flash disk, USB flash drive) or flash; another hard disk-based removable hard disk, which can be the most important for the removable disk mobile hard disk, mobile hard disk is different because of the hard disk is divided into mobile hard disk notebook and desktop hard drive. 可移动硬盘一般都是通过USB接口与计算机相连，S卩可移动硬盘作为一种存储介质，可存储其通过USB接口与计算机传输的数据。 Removable disks are generally connected to the computer through the USB interface, S Jie removable hard disk as a storage medium, which may store the data transmitted through the USB interface of the computer. 需要说明的是，第一排序列为用户在指示计算机节点创建数据表时，根据该第一数据的属性指定的对该第一数据进行排序的依据，即计算机节点可根据该第一排序列，通过对待存储的第一数据中，该本地内存中已缓存的各个部分数据分别进行排序，而使得该第一数据中的各个部分数据分别有序排列，进而保证该第一数据局部有序。  Incidentally, as a basis for sorting the first data table when the user instructs the computer to create a node specified by the attribute of the first data to the first sort data, i.e., based on the first computer node sort column, by treating the first data stored in the local memory data is cached in the respective portions, respectively, to sort, so that the respective partial data of the first data respectively ordered arrangement, thereby ensuring that the first data locally sequence. 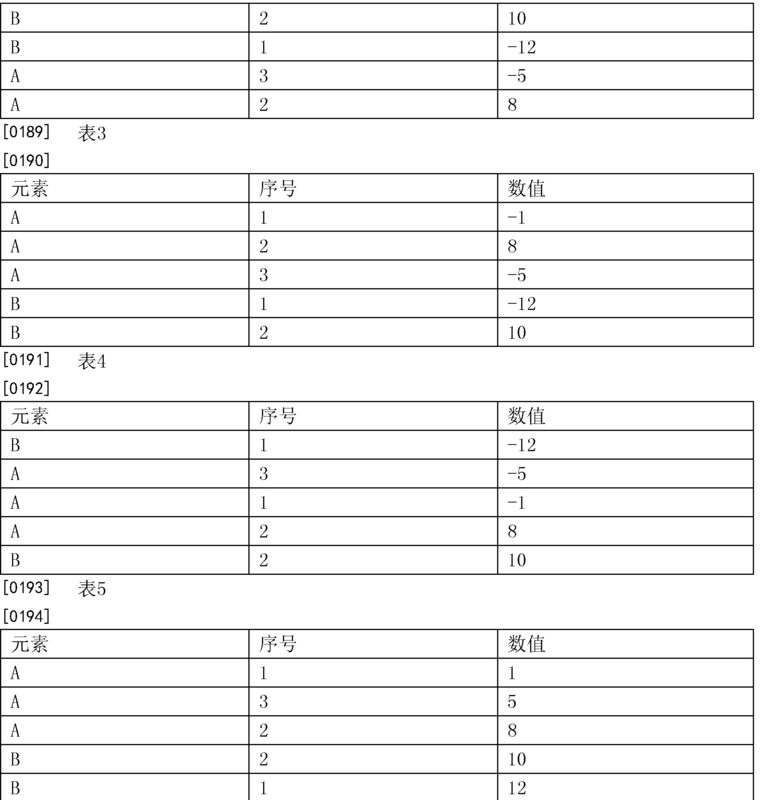 Create table t (cl int，c2 int，partial cluster key (cl，c2+l)指定数据表t 存储结构，且该数据表t存储结构中包括该第一排序列，即局部聚簇键。  Create table t (cl int, c2 int, partial cluster key (cl, c2 + l) t table designating data storage structure, and the data storage structure comprises a table t of the first sort column, i.e., the local cluster key . 其中，数据表是由一组数据记录组成的。  wherein, the data table is a set of data records. 一个数据表是一组相关的按行排列的数据;每个数据表中都含有相同类型的信息。 A data table is a set of related data arranged in rows; each data table contains the same type of information. 数据表实际上是一个二维表格，例如，一个班所有学生的考试成绩，可以存放在一个数据表中，数据表中的每一行对应一个学生，其包含所对应学生的所有信息，如可以包括学生的学号，姓名及各门课程的成绩等。 Data table is actually a two-dimensional form, for example, a class all students' test scores, can be stored in a data table, each row in the table corresponds to a student, which contains all the information corresponding to the student, such as may include the number of students learning, achievement and other names and each course. 数据表存储结构就是定义的一个数据表的字段、类型、主键、外键、索引等，即由这些基本的属性组成了数据表存储结构。  field is a data table storing a data table structure definition, types, primary keys, foreign keys, indexes, i.e. from these basic attributes table storage data structures. 确定了数据表存储结构后，可直接根据该数据表存储结构，插入不同类型的数据。 After determining a table storing the data structure, according to the data table directly storage structure, different types of data insertion. 数据库为存储数据的仓库，其由一个或一组数据表组成，数据库中的数据是以数据表为单位进行组织的。  database to store the data warehouse, which is composed of one or a set of data tables, the data is based on data in the database is organized into a table. 每个数据库都以文件的形式存放在磁盘上，即每个数据库对应于一个物理文件。 Each database are stored as files on disk, i.e., each corresponding to a physical database file. 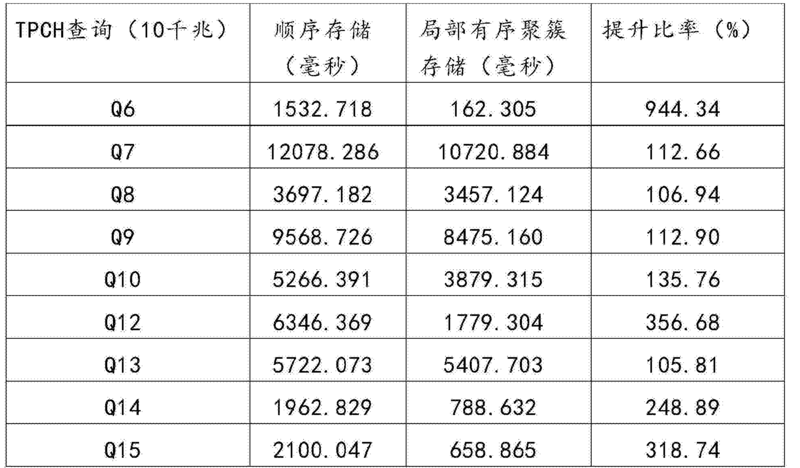 不同的数据库，与物理文件的对应方式也不相同。 A database in a corresponding manner, with different physical file is not the same. 例如，一个数据库可以包含一个数据表，也可以包含多个数据表。 For example, a database may comprise a data table may contain a plurality of data tables. [0M9]进一步地，本发明实施例提供的聚簇存储方法，由于计算机节点是在数据库系统中的本地内存中完成对第一数据的排序，且受该本地内存的大小及处理数据的能力限制， 因此，该计算机节点只能对该第一数据一部分一部分的进行排序，从而计算机节点再依次将排序后的该一部分一部分的数据存入数据库系统中的存储介质，进而能够保证该存储介质中存储的第一数据局部有序。 [0M9] Further, clustered storage method provided in the embodiment of the present invention, since the computer node is a complete sorting of the first data in a local memory in a database system, and by the ability to limit the size of the local memory and processing data Therefore, the computer node for only a portion of the first sorting data so that the data after a portion of the computer nodes in turn stored in the storage medium of the sorted database system, and further to ensure that the storage medium stores a first local order data. S103、若计算机节点在该本地内存中已缓存的第二数据满足预设条件，计算机节点则根据该第一排序列对该第二数据进行排序，该第二数据为该第一数据中的已缓存至该本地内存中的数据。  S103, the second data if the computer node local memory buffered meets a preset condition, the sort computer node based on the first column of the second sort data, the second data is the first data the cached data to the local memory. 计算机节点在缓存该第一数据的过程中，由于数据库系统中的本地内存的大小和处理数据的能力有限，因此，该第一数据可能无法一次全部缓存至该本地内存中，即计算机节点可将该第一数据一部分一部分的分别缓存至该本地内存中，从而计算机节点可依次对本地内存中分别缓存的数据一部分一部分地进行处理。  Computer nodes of the first data in the cache the process, due to the limited size and the capacity of local processing data memory database system, and therefore, the first data may not all at once into the local cache memory, i.e., the computer the first node may buffer data respectively to a portion of the local memory of the computer nodes so that a portion of the local memory may sequentially process data cache, respectively. 具体的，计算机节点可实时地统计本地内存中已缓存的第二数据的情况，当计算机节点检测到在本地内存中已缓存的第二数据满足预设条件时，计算机节点可开始根据该第一排序列对该第二数据进行排序，其中，该第二数据为该第一数据中的已缓存至该本地内存中的数据。 Specifically, the statistics in real time computer node where buffered in the local memory of the second data, when the computer detects a second node in the local memory data buffered meets a preset condition, the computer may begin based on the first node the second sort column to sort the data, wherein the second data is the first data to the data cached in the local memory. 进一步地，上述预设条件可以用于表征该本地内存中已缓存的第二数据的数据量与该本地内存允许存储的数据量之间的关系。 The amount of data  Further, the preset condition may be used to characterize the local memory data is cached in the second local memory allows the relationship between the amount of data stored. S104、计算机节点将排序后的该第二数据聚簇存储至数据库系统中的存储介质中。  S104, the second computer node to the data sort stored in the clustered database system storage medium. 在数据库中，为了提高某个属性或属性组的查询速度，可以将该属性或该属性组(称为聚簇码)上具有相同值的元祖集中存放在连续的物理块中，这种存储方法称为聚簇。  In the database, in order to speed up the search of a property or group of properties, the property or the property can be set (called cluster code) tuples have the same value on a centrally stored in consecutive physical block, which seed storage method is called clustering. 使用聚簇存储数据可以大大提高按聚簇码进行查询的效率。 Using clustered storage data can greatly improve query efficiency by clustering code. 计算机节点对该第二数据进行排序后，计算机节点可将排序后的该第二数据聚簇存储至数据库系统中的存储介质中，从而完成对该第二数据的装载过程。 After  the second computer node to sort data, the second computer node may be sorted data is stored in the clustered database system storage medium to complete the loading process of the second data. 需要说明的是，计算机节点可重复执行上述S101-S104,直至将待存储的第一数据全部存储至数据库系统中的存储介质中。  Incidentally, a computer node may repeat the above-described S101-S104, until the data to be stored in a first database system to store all the storage medium. 可以理解的是，计算机节点可依次对该第一数据中，已缓存至该本地内存中的每部分数据分别按照预设的第一排序列进行排序，并将每次排序后的该每部分数据存储至该存储介质中，从而可保证该存储介质中存储的第一数据局部有序，即该存储介质中存储的第一数据中的每部分数据都有序排列。  It will be appreciated that the computer may turn on the first node data, each part of the cached data to the local memory are sorted according to the preset first sorting columns, and each of the sorted each part of the data stored in the storage medium, which can ensure that the storage medium data stored in a first local order, that is, each portion of the first data stored in the storage medium are ordered. 示例性的，若用户需将第一数据，即某学院舞蹈系的500名学生的信息存储至数据库系统中的存储介质中，以便于后续访问，则用户首先需将该500名学生的信息输入计算机节点，并以文本的形式存储在计算机节点的硬盘中。  Exemplary, if the user needs a first data, i.e., 500 students of a college dance department store to the database system information storage medium, for subsequent access, the user first needs to 500 students the node information into the computer, and stored in the form of text nodes in a computer's hard disk. 在计算机节点根据用户的指示将该500 名学生的信息存入数据库系统中的存储介质的过程中，计算机节点可将该500名学生的信息从硬盘的文本中读入数据库系统中的本地内存中，具体的，计算机节点可将该500名学生的信息，按照每个学生逐行将每个学生的信息依次读入该本地内存中。 In the process computer node according to the user's instruction information 500 stored in the storage medium student database system, a computer node 500 may be the student database system information reading from the local memory of the hard disk the text , specifically, the computer node 500 students of information, line by line for each student each student information successively read into the local memory. 假设每个学生的信息包括:班级、姓名、学号、年龄、特长、家庭情况等属性，则通过本发明实施例提供的聚簇存储方法，可将这500名学生的信息组成一个数据表，如表1所示， 其中，表1中的每行（即每个学生的信息)为一个元组，每列(所有学生的某项信息)为一个属性。  Assuming that each student's information includes: the class, name, student number, age, specialty, family situation, etc. properties, the present invention is a clustered storage method provided in this embodiment, these may be composed of information on 500 students of a data table, as shown in table 1, wherein each row in table 1 (i.e., information for each student) is a tuple, each column (all students an information) as an attribute. Τ0Ϊ62]~需要说明的是，由于用户在输入这500名学生的信息时可能并不是按照特定的顺序输入的，所以硬盘的文本中存储的这500名学生的信息并不是有序排列的，为了便于后续可继续重复使用这500名学生的信息，如对这500名学生的信息进行查询、排序等操作，则需要将这500名学生的信息存入数据库系统中的存储介质中，以方便长期使用，避免重复劳动。 Τ0Ϊ62] ~ Incidentally, it may not be entered in a specific order due to a user input 500 students of this information, the text information stored in the hard disk 500 students that are not ordered, the order easy to follow can continue to reuse the 500 students of information, such as 500 students of this information query, sorting and other operations, we need these 500 students of information stored in the database system of the storage medium in order to facilitate long-term , to avoid duplication of effort. 特别的，在将数据存入数据库系统中的存储介质中时，一般可使用相应的数据表存储结构进行存储。 In particular, data stored in the database in the system storage medium, generally using the corresponding table data storage structure for storage. 与现有技术提供的数据表存储结构相比，本发明实施例提供的数据表存储结构(本发明实施例中计算机节点创建的数据表的存储结构），即表1所示的数据表存储结构， 能够保证在对数据装载性能和数据更新性能影响较小的同时，提高数据查询性能和数据压缩效率。 Compared with the prior art data storage structure table provided in the data table storage structure according to an embodiment of the present invention (structure of the data table stored in the computer according to embodiments of the present invention created node), i.e., a data table stored in the configuration shown in Table 1 , to ensure the performance of data loading and data updates less impact performance while improving data query performance and data compression efficiency. 根据上述表1可以得知，在该例子中，用户指定的第一排序列，即局部聚簇键（主键)可以为班级和学号，这是因为只有班级和学号两个属性同时确定才能够确定每一位学生，即只有同时确定班级和学号才能够对每一位学生进行区分。  According to the above Table 1 that, in this example, a first user-specified sort column, i.e., local clustering key (primary key) for the class and student number, since only two classes and attributes student number At the same time determined to be able to determine each student, while determining that only classes and student number to be able to distinguish between each student. 通过本发明实施例提供的聚簇存储方法，可将待存储的第一数据，一部分一部分地排序后存储至数据库系统中的存储介质中，并保证存储至该存储介质中的每部分数据都有序排列，这样由于可对待存储的数据一部分一部分进行排序并存储，以完成数据的装载， 因此，可以保证该存储介质中的数据局部有序，从而，能够保证在对数据装载性能和数据更新性能影响较小的同时，提高数据查询性能和数据压缩效率。 Clustered storage method provided in the  embodiment of the present invention, a first data to be stored, a portion of the sorted database system stored in a storage medium, and to ensure that each portion of the memory storage medium It ordered data, since this data to be stored in a portion of sorted and stored in order to complete the loading of data, and therefore, can ensure that the data storage medium local order, thereby, to ensure the performance and load of the data performance data updates less affected, while improving data query performance and data compression efficiency. 本发明实施例提供一种聚簇存储方法，通过将待存储的第一数据逐行缓存至数据库系统中的本地内存中，并确定第一排序列，该第一排序列用于对该本地内存中已缓存的数据进行排序，且若本地内存中已缓存的第二数据满足预设条件，则根据该第一排序列对该第二数据进行排序，该第二数据为该第一数据中的已缓存至该本地内存中的数据，以及将排序后的该第二数据聚簇存储至数据库系统中的存储介质中。  The present invention provides a method of clustered storage, to be stored by the first data row to the database cache in the local memory system, and determining a first sort column, sorting the first column for the local memory data is sorted buffered, and if the second local memory data buffered meets a preset condition, then sorted according to the sorting of the first column of the second data, the second data is the first data cached to the data in the local memory, the second and the sorted data clustered database system stored in the storage medium. 通过该方案，在将待存储的第一数据逐行缓存至本地内存的过程中，当在本地内存中已缓存的第二数据的数据量超出本地内存允许存储的数据量时，开始根据确定的第一排序列，对该第二数据进行排序，以及将排序后的该第二数据存入数据库系统中的存储介质中，由于可对待存储的数据一部分一部分进行排序并存储，以完成数据的装载，因此，可以保证数据库系统中的存储介质中的数据局部有序，从而能够保证在对数据装载性能和数据更新性能影响较小的同时，提高数据查询性能和数据压缩效率。 By this embodiment, the process to be stored in the first data row to the local buffer memory when the amount of data buffered in the local memory of the local memory of the second data exceeds the allowable amount of data storage, in accordance with the determined start a first sorted column, the second sort data, the second and the sorted data into the database system, storage medium, since the data to be stored can be sorted and a portion of memory to complete loading data data, therefore, the database system can ensure storage medium local order, thereby ensuring the performance of the data loading and data updating performance less effect while improving data compression efficiency of the data and query performance. S201、计算机节点在数据库系统中的存储介质中创建数据表，该数据表用于装载待存储的第一数据。  S201, the node computer storage media in the database system created in the data table, the data table for loading a first data to be stored. 若需将硬盘的文本中存储的数据，即待存储的第一数据存储至数据库系统中的存储介质中，计算机节点则可首先在该存储介质中创建数据表，其中，该数据表可用于装载该第一数据。  For the text data stored in the hard disk, the first data stored in a database system that is to be stored in the storage medium, a computer node can first create a data table in the storage medium, wherein, for the Table the first data available for loading. 本领域技术人员可以理解，本发明实施例提供的数据库系统中的存储介质可以为磁盘，磁盘可以包括硬盘和软盘。  Those skilled in the art will appreciate, the database system according to an embodiment of the present invention, a storage medium may be a disk, the disk may include a hard disk and floppy disk. 常用的磁盘一般为可移动磁盘，可移动磁盘可以分为两大类:一类为基于芯片存储的USB盘或闪盘;另一类为基于硬盘的移动硬盘，其中，可移动磁盘中最主要的为移动硬盘，而移动硬盘又因硬盘的不同分为笔记本移动硬盘和台式机移动硬盘。 Commonly used generally disk as a removable disk, a removable disk may be divided into two categories: one is based on a disk or USB flash memory chip; the other based on the mobile hard disk, wherein the movable main disk for mobile hard disk, mobile hard disk because hard disk divided into mobile hard disk notebook and desktop hard drive. 可移动硬盘一般都是通过USB接口与计算机相连，即可移动硬盘作为一种存储介质，可存储其通过USB接口与计算机传输的数据。 Removable disks are generally connected to the computer through the USB interface, to move the hard disk as a storage medium, which may store the data transmitted through the USB interface of the computer. S202、计算机节点将该第一数据逐行缓存至数据库系统中的本地内存中。  S202, the first computer node progressive cache data to the database in the local memory system. 本发明实施例提供的聚簇存储方法，为了便于以后对该第一数据进行访问，则在该第一数据存储过程中，计算机节点需先对该第一数据进行排序，然后再将排序后的该第一数据存入数据库系统中的存储介质中。  Clustered storage method provided in the embodiment of the present invention, in order to facilitate later access to the first data, the first data storage process, the computer must first node of the first data is sorted, and then the first sorted data into the database system of the storage medium. 计算机节点在将该第一数据存储至该存储介质的过程中，计算机节点首先需要从硬盘将该第一数据读入至数据库系统中的本地内存。 A first computer node storing the data to the storage medium, the computer a first node first requires the data read from the hard disk to the local memory in a database system. 具体的，计算机节点可以从硬盘将该第一数据逐行缓存至该本地内存中。 Specifically, the computer nodes to the local memory may be a hard disk from the first data row cache. S203、计算机节点确定第一排序列，该第一排序列用于对该本地内存中已缓存的数据进行排序。  S203, a first computer node determines the sort column, sorting the first column of the local memory for the buffered data is sorted. 计算机节点在将该第一数据逐行缓存至该本地内存的过程中，计算机节点可确定第一排序列，其中，该第一排序列可用于对该本地内存中已缓存的数据进行排序。  Computer nodes during the first data row to the local cache memory, the computer a first node may determine the sort column, wherein the first column may be used to sort the local memory data is cached Sort. [0〃5]特别的，该第一排序列可以称为主键，也可以称为局部聚簇键。 [0〃5] In particular, the first column may be referred to as the primary sort key, it may also be referred to as local cluster key. 数据库为存储数据的仓库，其由一个或一组数据表组成，数据库中的数据是以数据表为单位进行组织的。  database to store the data warehouse, which is composed of one or a set of data tables, the data is based on data in the database is organized into a table. 每个数据库都以文件的形式存放在磁盘上，即每个数据库对应于一个物理文件。 Each database are stored as files on disk, i.e., each corresponding to a physical database file. 不同的数据库，与物理文件的对应方式也不相同。 A database in a corresponding manner, with different physical file is not the same. 例如，对于dBASE，FoxPro 和Paradox格式的数据库来说，一个数据表就是一个单独的数据库文件，而对于Microsoft Access、Btrieve格式的数据库来说，一个数据库文件可以包含有多个数据表。 For example, a database for dBASE, FoxPro, and Paradox format, one data table is a separate database file, the database for Microsoft Access, Btrieve format, one database file may contain a plurality of data tables. 进一步地，本发明实施例提供的聚簇存储方法，由于计算机节点是在数据库系统中的本地内存中完成对第一数据的排序，且受该本地内存的大小及处理数据的能力限制， 因此，该计算机节点只能对该第一数据一部分一部分的进行排序，从而计算机节点再依次将排序后的该一部分一部分的数据存入数据库系统中的存储介质，进而能够保证该存储介质中存储的第一数据局部有序。  Further, clustered storage method provided in the embodiment of the present invention, since the computer node is a complete sorting of the first data in a local memory in a database system, and by the ability to limit the size of the local memory and processing data Therefore, the computer node for only a portion of the first sorting data so that the data after a portion of the computer nodes in turn stored in the storage medium of the sorted database system, and further to ensure that the storage medium stores a first local order data. 可选的，上述第一排序列可以包括物理列和表达式中的至少一个。  Optionally, the first column can include a physical sorting of columns and at least one of expressions. 具体的，该第一排序列可以为物理列，可以为表达式，也可以为物理列和表达式，还可以为其他任意满足排序需求的形式，本发明不作限制。 Specifically, the first column may be physically sorted columns may be an expression, and may be a physical column expression, may also be any other form to meet the needs of the sorting, the present invention is not limited. 示例性的，以上述指定第一排序列的语句为例，在该语句中，第一排序列为“cl，c2 +1”，其中，“cl”为物理列，“c2+l”为表达式。  Exemplary, the statement to the designated first sort column, for example, in the statement, the first ordering as "cl, c2 +1", wherein, "cl" physical column, "c2 + l "as the expression. 进一步地，如表2所示，若该表中的数据为待存储的第一数据，则第一排序列可以为元素列和序号列，或数值列，其中，元素列和序号列，或数值列可称为物理列;第一排序列也可以为数值列的绝对值，其中，数值列的绝对值可称为表达式。  Further, as shown, if the data in the table is to be stored in the first data in Table 2, the first row of elements may be sorted column and row number, column or value, wherein the number row and column elements or a sequence of numbers may be referred to as a physical column; the column first ordering value may be an absolute value for the column, wherein the absolute value of the numerical sequence may be referred to as expression. 可以理解的是，计算机节点可根据用户按照自身的需求指定的上述的第一排序列对表2所示的第一数据进行排序。 It will be appreciated that the columns of the first computer node data shown in Table 2 are sorted according to the above-described first sorted according to their user-specified requirements. 具体的，若第一排序列为元素列和序号列，则计算机节点按照第一排序列的数值从小到大(元素列按照字母先后，序号列按照数值大小)对表2中的数据排序后的结果如表3 所示;若第一排序列为数值列，则计算机节点按照第一排序列的数值从小到大对表2中的数据排序后的结果如表4所示;若第一排序列为数值列的绝对值，则计算机节点按照第一排序列的数值从小到大对表2中的数据排序后的结果如表5所示。  Specifically, if the first sort of elements as the number row and column, the value of the first computer node according to the ascending sort column (column element according to the alphabetical, numerical values ​​according to the column number) of the data in Table 2 results table 3 shows the sorted; column value as if the first sort, then the computer nodes in the small value of the first column to sort the results to the big data sorted in table 2. as shown in table 4; when the first sorting the absolute value as a numerical sequence, in accordance with the value of the first computer node column sorted in ascending sort the large data in table 2 the results shown in table 5. *~由上述表3、表4、表5可以看出，不同的第一排序列_，排序的结果是不相同的；相同_ 的第一排序列，以第一排序列的表达式排序的结果与直接以第一排序列排序的结果也是不相同的。 *  - from the above Table 3, Table 4, Table 5 can be seen, the first sort column _ different sort result is not the same; a first column of the same sort _, ​​expression of the first sort column ordering the results with the results of the first sort column directly to the sort is not the same. 具体的，可以根据实际使用需求进行排序，本发明不做限制。 Specifically, can be sorted according to actual needs, the present invention is not limited. 可选的，该第一排序列的数量可以为至少一个，即对该第一数据进行排序的依据可以为至少一个。 Under  Alternatively, the number of the first column may be sorted, i.e. the first data into at least one sort may be at least one. 其中，当该第一排序列的数量为至少两个时，该至少两个第一排序列可以包括一个主第一排序列和至少一个次第一排序列，从而计算机节点可先根据该主第一排序列对第一数据中的各部分数据进行排序，再分别根据该至少一个次第一排序列对第一数据中的各部分数据进行排序。 Wherein, when the number of the first row of the at least two sorted, the first sorting the at least two main column may comprise a first column and at least one secondary sorting a first sorted column, so that the computer can first node based on the main section a portion of each sorted column of data of the first data to be sorted, and then were based on the at least one first sort views of portions of the data of the first column of data to be sorted. 示例性的，以上述第一排序列为“cl，C2+l”为例，其中，“cl”为主第一排序列，“c2+ Γ为次第一排序列。  Exemplary, the first sort order as "cl, C2 + l", for example, where, "cl" main column first ordering, "c2 + Γ to a first secondary sort column. 进一步地，如表2所示，若第一排序列为元素列和序号列，则可将元素列设置为主第一排序列，将序号列设置为次第一排序列;也可以将序号列设置为主第一排序列，将元素列设置为次第一排序列，具体的设置形式可根据实际需求进行适应性的调整，本发明不作限制。  Further, as shown in Table 2, when the sorting as a first element row and column number, the element may be a first column as the primary sort column, the column number is set to a first secondary sort column; may be the first number column as the primary sort column, the first column to sort the element row times, specific form may be set adaptively adjusted according to actual needs, the present invention is not limited. S204、计算机节点检测该本地内存中已缓存的第二数据是否满足预设条件，该第二数据为该第一数据中的已缓存至该本地内存中的数据。  S204, detecting whether the second computer node to the local memory data buffered meets a preset condition, the second data is the first data to the data cached in the local memory. 计算机节点将该第一数据缓存至该本地内存中的过程中，计算机节点可检测该本地内存中已缓存的第二数据是否满足预设条件，其中，该第二数据可以为该第一数据中的已缓存至该本地内存中的数据。 Process  The first computer node to said local data cache memory, the node may detect whether the second computer to the local memory data buffered meets a preset condition, wherein the second data may be for the first a data cached data to the local memory. 其中，该预设条件可以用于表征该本地内存中已缓存的第二数据的数据量与该本地内存允许存储的数据量之间的关系。 The amount of data  wherein, the predetermined condition may be used to characterize the local memory data is cached in the second local memory allows the relationship between the amount of data stored. 该预设条件可以为该第二数据的行数大于或等于第一预设阈值，也可以为该第二数据占用该本地内存的大小大于或等于第二预设阈值，还可以为其他任意满足设计要求的预设条件，本发明不作限制。 The predetermined condition may be the number of rows is the second data is equal to or greater than a first predetermined threshold value, the second data occupying the local memory size is equal to or greater than a second predetermined threshold that may be, it may be other arbitrary pattern preset condition design requirements, the present invention is not limited. 具体的，计算机节点可检测该本地内存中已缓存的第二数据的行数是否大于或等于第一预设阈值;或者计算机节点可检测该本地内存中已缓存的第二数据占用该本地内存的大小是否大于或等于第二预设阈值。  Specifically, the computer can detect whether the node number of rows in the local memory of the second buffered data is greater than or equal to a first predetermined threshold; or the computer may detect a second node of the data cached in the local memory occupied by the whether the local memory size equal to or greater than a second predetermined threshold value. 需要说明的是，第一预设阈值和第二预设阈值的取值可以根据计算机节点实际使用的内存的大小和内存处理数据的能力进行设置，本发明不作限制。  Incidentally, the first predetermined threshold value and a second predetermined threshold value may be set based on memory size and memory capacity of a computer data processing node actually used, the present invention is not limited. S205、若计算机节点在该本地内存中已缓存的第二数据满足预设条件，计算机节点则根据该第一排序列对该第二数据进行排序。  S205, the second data if the computer node local memory buffered meets a preset condition, the sort computer node based on the second data to the first sort column. 计算机节点在缓存该第一数据的过程中，由于数据库系统中的本地内存的大小和处理数据的能力有限，因此，该第一数据可能无法一次全部缓存至该本地内存中，即计算机节点可将该第一数据一部分一部分的分别缓存至该本地内存中，从而计算机节点可依次对本地内存中分别缓存的数据一部分一部分地进行处理。  Computer nodes of the first data in the cache the process, due to the limited size and the capacity of local processing data memory database system, and therefore, the first data may not all at once into the local cache memory, i.e., the computer the first node may buffer data respectively to a portion of the local memory of the computer nodes so that a portion of the local memory may sequentially process data cache, respectively. 具体的，计算机节点可实时地统计本地内存中已缓存的第二数据的情况，当计算机节点检测到在本地内存中已缓存的第二数据满足预设条件时，计算机节点可开始根据该第一排序列对该第二数据进行排序。 Specifically, the statistics in real time computer node where buffered in the local memory of the second data, when the computer detects a second node in the local memory data buffered meets a preset condition, the computer may begin based on the first node the second sort column to sort the data. 举例来说，若第一预设阈值为10000行，则当本地内存中已缓存的第二数据的行数大于或等于10000行时，计算机节点则可开始根据该第一排序列对该第二数据进行排序;相应的，若第二预设阈值为6千兆字节，则当该本地内存中已缓存的第二数据占用该本地内存的大小大于或等于6千兆字节时，计算机节点则可开始根据该第一排序列对该第二数据进行排序。  For example, if the first threshold is 10000 rows, the local memory when the second data is cached or equal to the number of rows is greater than 10,000 rows, columns computer node can start according to the first ordering when appropriate, if the second predetermined threshold is 6 gigabytes, the second data when the buffered local memory occupation of the local memory size is greater than or equal to 6 gigabytes; the second sort data , computer nodes can begin sorting based on the first column of the second sort data. 进一步地，该本地内存中已缓存的第二数据占用该本地内存的大小还可以由百分比来表示。  Further, the second data in the local memory of the occupation of the local cached memory size may also be expressed as a percentage. 如该本地内存的容量为8千兆字节，第二预设阈值为可以为8千兆字节的90% (百分之），则当该本地内存中已缓存的第二数据占用该本地内存的大小大于8千兆字节的90% 时，计算机节点可开始根据该第一排序列对该第二数据进行排序。 The second data of the local memory capacity of 8 gigabytes, the second predetermined threshold value may be 90% 8 gigabytes (percent), the local memory when the occupancy of the local cached when memory size is greater than 8 gigabytes of 90%, a computer node may begin the second column to sort the data according to the first order. 进一步地，本发明实施例提供的聚簇存储方法中，计算机节点在对第一数据进行排序时，可根据该第一排序列的数值大小或该第一排序列的数值的哈希值大小对该第二数据进行排序。  Further, clustered storage method provided in the embodiment, when the first data is sorted, the numerical sequence may be a computer node according to the magnitude of the value of the first row or the first sort sorted hash embodiment of the present invention the second value of the size of the data is sorted. 其中，可根据哈希算法，将任意长度的二进制值映射为固定长度的较小的二进制值，该固定长度的较小的二进制值称为该二进制值的哈希值。  wherein, according to the hash algorithm, the binary value mapping arbitrary length binary value to a smaller fixed length, the smaller the value of the binary hash value of a fixed length referred to as the binary value. 哈希值是一段数据唯一且极其紧凑的数值表示形式。 Hash value is a unique value of a period and extremely compact data representation. 如，若计算一段数据的哈希值，且在计算前后只要更改该一段数据中的任意一个字符，则该一段数据更改前后两次计算的哈希值也是不相同的。 For example, if the hash value is calculated for some of the data, and as long as any change in the character of the piece of data, then the period before and after the two data changes the hash value calculated before and after the calculation is not the same. 相应的，第一排序列的数值的哈希值可以为根据哈希算法，将第一排序列的数值的二进制值映射为固定长度的较小的二进制值得到的。  Accordingly, the hash value of the value of the first column can be sorted according to the hash algorithm, the binary value of the mapped column values ​​sorted worth to first smaller binary fixed length. S206、计算机节点将排序后的该第二数据逐行插入数据表中，以将排序后的该第二数据聚簇存储至该存储介质中。  S206, the second computer node of the sorted data table row insert data, to the second sorted data clustered into the storage medium. 在数据库中，为了提高某个属性或属性组的查询速度，可以将该属性或该属性组(称为聚簇码)上具有相同值的元组集中存放在连续的物理块中，这种存储方法称为聚簇。 Tuple  in the database in order to speed up the search of a property or group of properties, the property or the property can be set (referred to as cluster code) having the same value stored centrally on the continuous physical blocks, this storage method is called clustering. 使用聚簇存储数据可以大大提高按聚簇码进行查询的效率。 Using clustered storage data can greatly improve query efficiency by clustering code. 计算机节点对该第二数据进行排序之后，计算机节点可将排序后的该第二数据逐行插入计算机节点创建的数据表中，以将排序后的该第二数据聚簇存储至该数据库系统中的存储介质中，从而完成对该第二数据的装载过程。  After the second computer node to sort data, the second computer node may be sorted data table row insert data created computer node, to the second data stored in the clustered ordering database system storage medium in order to complete the loading process of the second data. 具体的，计算机节点可将排序后的第二数据聚簇存储至数据库系统中的存储介质中的空闲物理块中，该空闲物理块为除第三数据占用的物理块之外的物理块，该第三数据为该第一数据中，在该第二数据之前已聚簇存储至该存储介质中的数据。  Specifically, the second computer node may be sorted data stored in the clustered database system storage medium free physical block, the spare physical block except for the physical data of the third physical block occupied by block, a first data, prior to the second data has been stored clustering data to the storage medium of the data for the third. 特别的，计算机节点可以将排序后的第二数据聚簇存储至该存储介质中连续的空闲物理块中，也可以将排序后的第二数据聚簇存储至该存储介质中不连续的空闲物理块中(例如将第二数据中的某部分数据聚簇存储至某些连续的空闲物理块，将第二数据中的其他部分数据聚簇存储至其他某些连续的空闲物理块，其中，该某些连续的空闲物理块和该其他某些连续的空闲物理块不是连续的物理块），具体的存储形式，本发明不作限制。  In particular, the second computer node may be clustered sorted data into the storage medium in contiguous free physical block, the second data may be sorted clustered into the storage medium discontinuous free physical block (e.g., a portion of the second data stored in the cluster to some contiguous free physical blocks, other parts of the cluster data of the second data stored to some other physical contiguous free blocks, wherein some of the continuous free physical block and the certain other free physical block is not continuous consecutive physical blocks), specific forms of storage, the present invention is not limited. 即无论本发明采用上述何种存储形式，都能够保证存储至该存储介质中的数据是局部有序的。 I.e., whether the present invention, the above-described storage format which are stored in the data to ensure that the storage medium is a partially ordered. 需要说明的是，计算机节点可重复执行上述S202-S206,直至将待存储的第一数据全部存储至数据库系统中的存储介质中。  Incidentally, a computer node may repeat the above-described S202-S206, until the data to be stored in a first database system to store all the storage medium. 可以理解的是，计算机节点可依次对该第一数据中，已缓存至该本地内存中的每部分数据进行排序，并将每次排序后的该每部分数据存储至该存储介质中，从而可保证该存储介质中存储的第一数据局部有序，即该存储介质中存储的第一数据中的每部分数据都有序排列。  It will be appreciated that the computer may turn on the first node data, cached data to each part of the local memory to be sorted, and each portion of each of the sorted data is stored to the storage medium , thereby ensuring that the first storage medium data stored in the local order, i.e., each portion of the first data stored in the storage medium are ordered. 需要说明的是，由于用户在输入这500名学生的信息时可能并不是按照特定的顺序输入的，所以硬盘的文本中存储的这500名学生的信息并不是有序排列的，为了便于后续可继续重复使用这500名学生的信息，如对这500名学生的信息进行查询、排序等操作，则需要将这500名学生的信息存入数据库系统中的存储介质中，以方便长期使用，避免重复劳动。  Incidentally, since the user input 500 students this information may not be entered in a specific order, so that the text information in the hard disk storage 500 students not ordered arrangement, for easy to follow can continue to reuse the 500 students of information, such as 500 students of this information query, sorting and other operations, we need these 500 students of information stored in the database system of the storage medium in order to facilitate long-term , to avoid duplication of effort. 特别的，在将数据存入数据库系统中的存储介质中时，一般可使用相应的数据表存储结构进行存储。 In particular, data stored in the database in the system storage medium, generally using the corresponding table data storage structure for storage. 与现有技术提供的数据表存储结构相比，本发明实施例提供的数据表存储结构(本发明实施例中计算机节点创建的数据表的存储结构），即表1所示的数据表存储结构， 能够保证在对数据装载性能和数据更新性能影响较小的同时，提高数据查询性能和数据压缩效率。 Compared with the prior art data storage structure table provided in the data table storage structure according to an embodiment of the present invention (structure of the data table stored in the computer according to embodiments of the present invention created node), i.e., a data table stored in the configuration shown in Table 1 , to ensure the performance of data loading and data updates less impact performance while improving data query performance and data compression efficiency. S207、计算机节点确定查询列。  S207, the computer node determines query column. 计算机节点将该第一数据全部存储至该存储介质中之后，若用户需对该第一数据进行查询操作，用户则需指定相应的查询列，即计算机节点可确定用户指定的查询列，其中，该查询列可用于以其为依据对该第一数据进行查询操作。 After  the first computer node all the data stored in the storage medium, if the user needs to perform a first query operation on the data, the user need specify the query column, i.e., a computer node may determine the user specified query column wherein the query column can be used to query its operation based on the first data. S208、计算机节点将该查询列与该第一排序列中的第一个排序列进行对比。  S208, the computer node query column compared to the first column first sort sort column. 计算机节点确定查询列之后，计算机节点可将该查询列与该第一排序列中的第一个排序列进行对比，以确定该查询列是否为该第一个排序列。 After  Computer nodes determining a query row, a computer node may compare the query and the first column to sort the first column sorted column, to determine if the query for the first column is a sort column. S209、计算机节点将该存储介质中存储的第一数据读入该本地内存中。  S209, a first computer node data stored in the storage medium is read into the local memory. 计算机节点在确定查询列之后，根据该查询列对第一数据进行查询操作之前，计算机节点需将该存储介质中存储的第一数据读入该本地内存中，以在该本地内存中完成数据的查询操作。 Before  After determining a query node computer columns, query operation on the first column of data based on the query, the first node of the computer data storage medium needs to read the stored local memory to the local memory complete query data. 在执行S207之后，本发明不限制S208和S209的执行顺序，即本发明可以先执行S208，后执行S209;也可以先执行S209，后执行S208;还可以同时执行S208和S209。  After execution of S207, the present invention does not limit the order of execution of S208 and S209, i.e., the present invention may be performed before S208, after performing S209; S209 may be first performed, after performing S208; S208 and S209 may also be performed simultaneously. S210、若该查询列为该第一个排序列，计算机节点则可根据该第一个排序列，在该本地内存中对该第一数据进行查询操作。  S210, if the query as a sort of the first column, the computer can be based on the first node a sorted column, the query operation in the local memory of the first data. 若该查询列为第一排序列中的第一个排序列，计算机节点则可根据该第一个排序列，在该本地内存中对该第一数据进行查询操作。  If the query as a first column of the first sort sort column, the computer can be based on the first node a sorted column, in the local memory a first query operation on the data. 可以理解的是，若该第一排序列的数量为一个，则该第一个排序列为第一排序列； 若该第一排序列的数量为两个以上，则该第一个排序列为该第一排序列中的主第一排序列。  It will be appreciated that the number if the first column is a sort, the sorting as a first sorting the first column; if the first sort column number is two or more, the first sorting as a first sorting the primary sorted column of the first column. 具体的，本发明实施例提供的聚簇存储方法中，由于计算机节点可将第一数据一部分一部分的排序后聚簇存储在该存储介质中，因此，能够保证该第一数据在该存储介质中为局部有序排列的，从而，当需根据该第一个排序列对该第一数据进行查询操作时，计算机节点可将该存储介质中存储的第一数据读入该本地内存中，并在该本地内存中直接采用二分查找方式对第一数据的一个或多个数据页中的每个数据页进行查询操作。  Specifically, the cluster storage method according to an embodiment of the present invention, the node may be a computer in the storage medium, it is possible to ensure the clustering and stores a portion of the sorted data of the first data in the first storage medium is a partially ordered, whereby, when the column needs to query operation according to the first sort to the first data, a first node may store the computer data storage medium is read into the local memory and directly using a binary search mode in the local memory of a first data page or more data pages for each data query. 其中，二分查找又称折半查找，其优点是比较次数少，查找速度快，平均性能好;其缺点是要求待查表为有序表，且插入数据、删除数据比较困难。  wherein, binary search, also known as binary search, the advantage of a small number of comparisons, faster search speed, good average performance; disadvantage is the requirement to be ordered lookup table, and insert data, delete data more difficult. 因此，二分查找方式适用于不经常变动而查找频繁的有序列表。 Therefore, the binary search method is applicable to not change often and find frequently ordered list. 示例性的，假设列表中的元素是按第一排序列升序排列的，则将列表中间位置记录的关键字与查找关键字进行比较，如果两者相等，则查找成功;否则利用中间位置记录的关键字将列表分成前、后两个子列表，如果列表中间位置记录的关键字大于查找关键字，则进一步查找前一个子列表，否则进一步查找后一个子列表。 Exemplary list of elements is assumed in a first column in ascending order of the sort, the key will be the intermediate position of the recording keyword list is compared with the lookup, if the two are equal, then the lookup is successful; otherwise recorded using an intermediate position keyword list into before, after two sub-lists, keyword list if the middle of the recording is greater than the search key, then look for a further sub-list before, or after a further search sub-list. 重复以上过程，直到找到满足查询条件的数据，此时查找成功;或者直到子列表不存在为止， 此时查找不成功。 Repeat the process until you find data that satisfy the query, this time to find success; or until the child list does not exist, at which time search is unsuccessful. 需要说明的是，由于第一数据在该存储介质中是局部有序排列的，因此，计算机节点从该存储介质中读入该本地内存中的第一数据也是局部有序排列的，若需按照第一个排序列对该第一数据进行查询，计算机节点则可通过执行上述S207-S210快速地在该本地内存中的该第一数据中查找到满足查询条件的数据，从而减少了浏览数据和对比数据的次数，提高了数据查询性能。  Incidentally, since the first data in the storage medium is a partially ordered arrangement, therefore, a computer node from the storage medium is read into the local memory of the first data is also locally ordered arrangement, for a sorted column according to the first query, the computer can find the node that satisfy the query data by performing the above-described S207-S210 in the first data rapidly in the local memory of the first data, thereby reducing the number of browsing data and comparative data, improved data query performance. 进一步地，本发明实施例提供的聚簇存储方法中，如图4所示，还可以通过采用与第一数据对应的索引查询数据。  Further, embodiments clustered storage method provided in the present invention, may also query the index data corresponding to the first data by using 4 shown in FIG. 其中，可以在将该第一数据存储至该存储介质的过程中创建与该第一数据对应的索引，也可以在将该第一数据存储至该存储介质中之后再创建与该第一数据对应的索引，本发明不作限制。 Wherein, the first data may be stored in the storage medium in the process to create the first index corresponding to the data, the first data may be stored in the storage medium after the re-create the data corresponding to the first index, the present invention is not limited. 可以理解的是，与该第一数据对应的索引可以用于表示该第一数据在该存储介质中的具体存储位置，如与该第一数据对应的索引可以用于表示该第一数据在该存储介质中具体存储的物理块、数据页以及数据行。  It will be appreciated that the first data may be used to represent an index corresponding to the particular first data storage location in the storage medium, such as data corresponding to the first index may be used to represent the first in the physical block data stored in the storage medium specific data page and a data line. 具体的，采用本发明实施例提供的聚簇存储方法将第一数据存储至该存储介质中之后，由于第一数据为局部有序存储的，因此，可以根据查询列和创建的与该第一数据对应的索引直接在该存储介质中查找到需查找的数据行，从而，相对于现有技术中数据无序存储的情况，大大降低了数据查询次数，提升了数据查询性能。  Specifically, after using a clustered storage method according to an embodiment of the present invention, the first data into the storage medium, since the first data is stored in local order, therefore, according to the query can be created with the columns and the first data corresponding to the index in the storage medium directly look into the data lines need to find to, with respect to the prior art data storage disorder, greatly reducing the number of data query, data query performance improves. 特别的，由于根据与第一数据对应的索引查找数据的方法与现有技术中按照索引查找数据的方法类似，因此，此处不再赘述。  In particular, due to the location of the data corresponding to the first data according to a method similar to the method of the index data to find the index in accordance with the prior art, therefore, is not repeated here. S211、计算机节点确定第二排序列。  S211, the computer determines a second sort column node. 计算机节点将该第一数据全部存储至该存储介质中之后，若用户需对该第一数据进行排序，用户则需指定相应的排序列，即计算机节点可确定用户指定的第二排序列，其中，第二排序列可用于以其为依据对该第一数据进行排序操作。 After  the first computer node all the data stored in the storage medium, if a first user needs to sort the data, the user need specify the sort column, i.e., a second computer node may determine the user-specified ordering column, wherein the column of the second ordering may be used as a basis for its operation on the first data sorting. S212、计算机节点将该第二排序列与该第一排序列中的第一个排序列进行对比。  S212, the second computer node to the first sort column to sort the first column sorted column for comparison. 计算机节点确定第二排序列之后，计算机节点可将该第二排序列与该第一排序列中的第一个排序列进行对比，以确定该第二排序列是否为该第一个排序列。 After the  computer node determines a second sort column, the second computer node may sort the first column of the first column to sort the sort column are compared to determine whether the second ordering for the first column sort column. S213、计算机节点将该存储介质中存储的第一数据读入该本地内存中。  S213, a first computer node data stored in the storage medium is read into the local memory. 计算机节点在确定第二排序列之后，根据该第二排序列对第一数据进行排序操作之前，计算机节点需将该存储介质中存储的第一数据读入该本地内存中，以在该本地内存中完成数据的排序操作。 Before  After determining a second computer node sort column, the first column to sort the data according to the second sorting operation, a first computer node of the data storage medium is read into the required stored in a local memory, to the completion of the sorting operation in the local memory data. 在执行S211之后，本发明不限制S212和S213的执行顺序，即本发明可以先执行3212，后执行3213;也可以先执行3213，后执行3212;还可以同时执行3212和3213。  After execution of S211, the present invention does not limit the order of execution of S212 and S213, i.e., the present invention may be performed before 3212, after performing 3213; 3213 may be performed before, after performing 3212; 3212 and 3213 may also be performed simultaneously. S214、若该第二排序列为该第一个排序列，计算机节点则根据该第一个排序列，在该本地内存中对该第一数据进行排序操作。  S214, if the second sorting as a first sorting the column, based on the first computer node is a sorted column, in the local memory of the first data sorting operation. 若该第二排序列为该第一排序列中的第一个排序列，计算机节点则可根据该第一个排序列，在该本地内存中对该第一数据进行排序操作。  If the second sorting as a first sorting the first column of the sorted column, the computer can be based on the first node a sorted column, in the local memory of the first data sorting operation. 具体的，本发明实施例提供的聚簇存储方法中，由于计算机节点可将第一数据一部分一部分的排序后聚簇存储在该存储介质中，因此，能够保证该第一数据在该存储介质中为局部有序排列的，从而，当需根据该第一个排序列对该第一数据进行排序操作时，计算机节点可将该存储介质中存储的第一数据读入该本地内存中，并直接在该本地内存中对该第一数据中的每部分数据进行排序，即计算机节点可对该第一数据进行归并排序。  Specifically, the cluster storage method according to an embodiment of the present invention, the node may be a computer in the storage medium, it is possible to ensure the clustering and stores a portion of the sorted data of the first data in the first storage medium is a partially ordered, so that, when the need for a sorting operation according to the first sort the first column of data, a first node may store the computer data storage medium is read into the local memory and each part directly sort the data in the first data in the local memory, i.e., a computer node may merge sort on the first data. 其中，归并(Merge)排序为将两个(或两个以上)有序序列合并成一个新的有序序列的一种排序方法。  wherein, merge (the Merge) the order of two (or more) an ordered sequence into a combined method of ordering a new ordered sequence. 归并排序是建立在归并操作上的一种有效的排序算法。 Merge sort merge operation is based on an efficient sorting algorithm. 本发明实施例提供的归并排序可以为:计算机节点将聚簇存储至该存储介质中的若干个有序的子序列合并为一个整体的有序序列。 Merge sort provided in the embodiment of the present invention may be: a computer cluster node to store a plurality of ordered sub-sequence of the storage medium into one whole ordered sequence. 需要说明的是，由于第一数据在该存储介质中是局部有序排列的，因此，计算机节点从该存储介质中读入该本地内存中的第一数据也是局部有序排列的，若需按照该第一个排序列对第一数据进行排序，计算机节点则可通过执行上述S211-S214快速地在本地内存中对第一数据进行排序，从而能够提高对数据的排序效率。  Incidentally, since the first data in the storage medium is a partially ordered arrangement, therefore, a computer node from the storage medium is read into the local memory of the first data is also locally ordered arrangement, for the first columns of the data in accordance with a first sort order, the nodes may be sorted by the computer executing the above S211-S214 quickly in local memory of the first data, thereby improving the efficiency of sorting the data. S215、计算机节点确定聚合列。  S215, the computer node determines a polymerization column. 计算机节点将该第一数据全部存储至该存储介质中之后，若用户需对该第一数据进行聚合操作，用户则需指定相应的聚合列，即计算机节点可确定用户指定的聚合列，其中，聚合列可用于以其为依据对该第一数据进行聚合操作。 After  the first computer node all the data stored in the storage medium, if the user needs to perform the polymerization operation on the first data, the user need specify the aggregate column, i.e., a computer node may determine aggregate columns designated by the user wherein the polymerization column can be used to perform polymerization operation thereof based on the first data. 需要说明的是，本发明实施例提供的聚簇存储方法中，聚合操作为在第一数据中查找最大值或最小值的操作。  Incidentally, the storage cluster according to an embodiment of the method of the present invention, the polymerization operation is operative to find the maximum or minimum in the first data. S216、计算机节点将该聚合列与该第一排序列中的第一个排序列进行对比。  S216, the computer node to the first column of the polymerization sorting the first column sorted column for comparison. 计算机节点确定聚合列之后，计算机节点可将该聚合列与该第一排序列中的第一个排序列进行对比，以确定该聚合列是否为该第一个排序列。 After the  computer node determines a polymerization column, the computer node may aggregate column ordering to the first column first sorted column are compared to determine whether the polymerization column for a first sort column. S217、计算机节点将该存储介质中存储的第一数据读入该本地内存中。  S217, a first computer node data stored in the storage medium is read into the local memory. 计算机节点在确定聚合列之后，根据该聚合列对第一数据进行聚合操作之前，计算机节点需将该存储介质中存储的第一数据读入该本地内存中，以在该本地内存中完成数据的聚合操作。  After determining the polymerization computer node column, according to the polymerization prior to the first column of data aggregation operation, a first computer node of the data storage medium is read into the required stored in the local memory to the local memory to complete the polymerization operation data. 在执行S215之后，本发明不限制S216和S217的执行顺序，即本发明可以先执行S216,后执行S217;也可以先执行S217,后执行S216;还可以同时执行S216和S217。  After execution of S215, the present invention does not limit the order of S216 and S217 is performed, i.e., the present invention may be performed before S216, after performing S217; S217 may be first performed, after performing S216; S216 and S217 may also be performed simultaneously. S218、若该聚合列为该第一个排序列，计算机节点则根据该第一个排序列，在该本地内存中对该第一数据进行聚合操作。  S218, if the polymerization as a sort of the first column, the computer based on the first node a sorted column, polymerization operation performed in the local memory of the first data. 若该聚合列为该第一排序列中的第一个排序列，计算机节点则可根据该第一个排序列，在该本地内存中对该第一数据进行聚合操作。  If the polymerization of the first sort column as the first column to sort, according to the computer nodes can be sorted first column, the local memory for the first polymerization operation data. (1)计算机节点可根据该第一个排序列，在该本地内存中确定第一数据的一个或多个数据页中的每个数据页中的最大值或最小值。  (1) According to the first computer node a sorted column, to determine a first maximum or minimum data, the one or more pages of data in each data page in the local memory. (2)计算机节点依次比较该每个数据页中的最大值或最小值，以确定第一数据中的最大值或最小值。  (2) the computer nodes sequentially comparing each data page maximum or minimum, in order to determine the maximum or minimum value of the first data. 进一步地，本发明实施例提供的聚簇存储方法中，由于计算机节点可将第一数据一部分一部分的排序后聚簇存储在该存储介质中，因此，该第一数据在该存储介质中为局部有序排列的，从而，当需根据该第一个排序列对该第一数据进行聚合操作时，计算机节点可将该存储介质中存储的第一数据读入该本地内存中，并通过上述方法，在该本地内存中先根据该第一个排序列，确定出第一数据的一个或多个数据页中的每个数据页中的最大值或最小值，然后计算机节点再依次比较该每个数据页中的最大值或最小值，以确定出该第一数据中的最大值或最小值。  Further, the embodiment of the present invention is to provide a clustered storage method of the embodiment, since the computer nodes can be a portion of the sorted data of the first cluster is stored in the storage medium, and therefore, the first data in the storage medium in a partially ordered, whereby, when the column needs to be based on the polymerization operation of the first data to the first sort, a first node may store the computer data storage medium is read into the local memory, and by the above method, the sort column to a local memory based on the first, first determine the maximum or minimum data, one or more pages of data in each data page, and then in turn compare the computer node the data in each page maximum or minimum, in order to determine the maximum or minimum value of the first data. 需要说明的是，由于第一数据在该存储介质中是局部有序排列的，因此，计算机节点从该存储介质中读入该本地内存中的第一数据也是局部有序排列的，若需按照该第一个排序列对该第一数据进行聚合操作，计算机节点则可通过执行上述S215-S218快速地在该本地内存中完成对第一数据的聚合操作，即计算机节点能够快速地确定出该第一数据中的最大值或最小值，从而提高了对数据的聚合效率。  Incidentally, since the first data in the storage medium is a partially ordered arrangement, therefore, a computer node from the storage medium is read into the local memory of the first data is also locally ordered arrangement, for sorting in accordance with the first column of the first operation data aggregation, S215-S218 computer nodes can rapidly complete the polymerization operation on the first data by performing the above-described in the local memory, i.e., a computer node can quickly determining the maximum or minimum value of the first data, thus improving the polymerization efficiency of data. 进一步地，本发明实施例提供的聚簇存储方法中，如图4所示，还可以通过采用与第一数据对应的索引对数据进行聚合操作。  Further, embodiments clustered storage method provided in the present invention, as shown, may also be polymerized by using the operation data of the first data 4 corresponding to the index. 其中，可以在将该第一数据存储至该存储介质的过程中创建与该第一数据对应的索引，也可以在将该第一数据存储至该存储介质中之后再创建与该第一数据对应的索引，本发明不作限制。 Wherein, the first data may be stored in the storage medium in the process to create the first index corresponding to the data, the first data may be stored in the storage medium after the re-create the data corresponding to the first index, the present invention is not limited. 具体的，采用本发明实施例提供的聚簇存储方法将第一数据存储至该存储介质中之后，由于第一数据为局部有序存储的，因此，可以根据聚合列和创建的与该第一数据对应的索引直接在该存储介质中查找到一个或多个数据页中的每个数据页的最大值或最小值， 从而，相对于现有技术中数据无序存储的情况，大大降低了数据聚合操作的次数，提升了数据聚合性能。 After  Specifically, the present invention provides a method embodiment of the first cluster storing data into the storage medium, since the first data is stored in local order, therefore, can be created in accordance with the polymerization column and the first data corresponding to the index lookup directly in the storage medium to maximum or minimum of one or more data pages for each data page, whereby the prior art with respect to the data stored in random, substantially reducing the number of operation data aggregation, enhance the performance of data aggregation. 特别的，由于根据与第一数据对应的索引对数据进行聚合操作的方法与现有技术类似，因此，此处不再赘述。  In particular, since the method is similar to the prior art in accordance with the first data corresponding to the index data of the polymerization operation, and therefore, not further described herein. 可以理解的是，本发明不限制S207-S210、S211-S214和S215-S218的执行顺序，即当第一数据全部存储至该存储介质中之后，可根据实际的操作需求选择需执行的步骤。  It will be appreciated that the present invention is not limited S207-S210, S211-S214 and S215-S218 of the execution order, i.e., when all of the first data into the storage medium can then be selected according to the actual need to perform an operation demand A step of. 例如，对应于上述对第一数据进行查询、排序、聚合等操作的例子，若需对第一数据进行查询操作，则计算机节点可执行S207-S210;若需对第一数据进行排序操作，则计算机节点可执行S211-S214;若需对第一数据进行聚合操作，则计算机节点可执行S215-S218。 For example, data corresponding to the first query, sorting, etc. Examples of the polymerization operation, data query For the first operation, the computer-executable node S207-S210; For the first data sorting operation, computer-executable node S211-S214; for the polymerization operation of a first data, the computer-executable node S215-S218. 进一步地，上述列出的对第一数据进行的各种操作仅是示例性的，采用本发明实施例提供的聚簇存储方法存储第一数据后，还可根据其他相应的需求对第一数据进行对应的操作，本发明不作限制。  Further, various operations performed by the first data listed above are merely exemplary, and the storage method of storing cluster data using a first embodiment of the present invention provides, according to further other corresponding demand for data corresponding to the first operation, the present invention is not limited. 示例性的，如表6所示，为应用TPCH (—种商业智能计算测试标准)对数据进行测试时，现有技术提供的顺序存储和本发明实施例提供的局部有序聚簇存储的实际测试数据。  exemplary, as shown in Table 6, application TPCH (- Standard Test Species calculated BI) when the test data, the prior art and to provide a local order storage according to an embodiment of the present invention, the ordered cluster the actual test data storage. 其中，TPCH是由事务处理性能委员会(Transaction Processing Performance Council， TPC)发布的，其能够模拟决策支持系统中的数据库操作，测试数据库系统复杂查询的响应时间。 Which, TPCH is published by the Transaction Processing Performance Council (Transaction Processing Performance Council, TPC), which can simulate the database operations decision support system, database system test complex query response time. 由表6可以看出，采用现有技术提供的顺序存储方法存储数据时，应用TPCH对数据进行测试的时间，远远大于采用本发明实施例提供的聚簇存储方法存储数据时，应用TPCH 对数据进行测试的时间。 When  As can be seen from Table 6, using the storage method of storing data sequentially provided in the prior art, application time TPCH test data, far greater than when using a clustered storage method of storing data according to an embodiment of the present invention, application data TPCH the test of time. 即采用本发明实施例提供的聚簇存储方法存储数据，能够减小应用TPCH对数据进行测试的时间，从而提升应用TPCH对数据进行测试的测试性能。 I.e. using cluster storage method of storing data according to an embodiment of the present invention, it is possible to reduce the time of the application TPCH test data, so as to enhance the application of TPCH test data performance testing. 进一步地，如表6所示的应用TPCH对数据进行查询的操作中，本发明实施例提供的局部有序聚簇存储相对于现有技术提供的顺序存储，应用TPCH对数据进行查询的查询性能明显得到了提升。  Further, as shown in Table 6, TPCH application operates on the data in the query sequence stored in the storage cluster with local ordering provided by the prior art provided by the present invention, the application data query TPCH query performance has improved significantly. 尤其是Q6、Q12、Q15三个查询，其查询性能的提升百分比都在300%以上。 In particular Q6, Q12, Q15 three queries to improve query performance of its percentage in more than 300%. 需要说明的是，本发明实施例提供的聚簇存储方法，可以应用在数据库系统中的单个数据表的场景中，也可以应用在数据库系统中的多个数据表做连接(join)的场景中， 具体的，可根据实际使用需求应用本发明实施例提供的聚簇存储方法，本发明不作限制。  Incidentally, clustered storage method according to an embodiment of the present invention can be applied to a single scenario data table in the database system, a plurality of data tables may also be used in the database system is to make the connection (join) scene, particularly, the present invention is applied may be stored clustering method provided by the embodiment according to the actual needs, the present invention is not limited. 缓存单元10,用于将待存储的第一数据逐行缓存至所述数据库系统中的本地内存中。  buffer unit 10, a first row of data cache to be stored in the database system to the local memory. 确定单元11，用于确定第一排序列，所述第一排序列用于对所述本地内存中已缓存的数据进行排序。  determination unit 11 for determining a first sort column, sorting the first column of the local memory for the buffered data is sorted. 操作单元12,用于若所述缓存单元10在所述本地内存中已缓存的第二数据满足预设条件，则根据所述确定单元11确定的所述第一排序列，对所述第二数据进行排序，所述第二数据为所述第一数据中的已缓存至所述本地内存中的数据。  The operation unit 12, second data cache unit 10 is used if the cached in the local memory satisfies a preset condition, the unit 11 according to the determined first column of the sorted determination of their sorting said second data, said second data is the first data to the data cached in the local memory. 存储单元13,用于将所述操作单元12排序后的所述第二数据聚簇存储至所述数据库系统中的存储介质中。  The storage unit 13, 12 for the sorting after the second operation unit to store the data for a clustered database system storage medium. 可选的，所述预设条件用于表征所述本地内存中已缓存的第二数据的数据量与所述本地内存允许存储的数据量之间的关系。 The amount of data  Optionally, the preset condition for characterizing the local cache memory has a second data memory allows the local relationship between the amount of data stored. 其中，所述操作单元12,具体用于若所述缓存单元10在所述本地内存中已缓存的所述第二数据的行数大于或等于所述第一预设阈值，则根据所述第一排序列对所述第二数据进行排序。  wherein the operation unit 12, particularly if the buffer unit 10 to the local memory in the cached data of the second number of rows is greater than or equal to the first preset threshold, according to the the first column of the second sorting sorts the data. 其中，所述操作单元12,具体用于若所述缓存单元10在所述本地内存中已缓存的所述第二数据占用所述本地内存的大小大于或等于所述第二预设阈值，则根据所述第一排序列对所述第二数据进行排序。  wherein the operation unit 12, particularly if the cache for the local memory unit 10 in the second buffered data occupying the local memory size equal to or greater than the second predetermined threshold value, according to the first column of the second sorting sorts the data. 可选的，所述操作单元12,具体用于根据所述确定单元11确定的所述第一排序列的数值大小或所述第一排序列的数值的哈希值大小对所述第二数据进行排序。  Alternatively, the operation unit 12, specifically to the hash value is determined according to the size of the numerical value of the size of the sorting unit 11 determines a first row or the first column of the sorted The second data is sorted. 可选的，所述存储单元13,具体用于将所述操作单元12排序后的所述第二数据聚簇存储至所述存储介质中的空闲物理块中，所述空闲物理块为除第三数据占用的物理块之外的物理块，所述第三数据为所述第一数据中在所述第二数据之前已聚簇存储至所述存储介质中的数据。  Alternatively, the storage unit 13, specifically for the sorting after the operation unit 12 of the second cluster of data stored in the storage medium free physical block, the spare physical block physical block except for the physical block occupied by the third data, the third data is the first data already clustered in the second data storage prior to said data storage medium. 可选的，所述确定单元11确定的所述第一排序列包括物理列和表达式中的至少一个。  Alternatively, the determination unit 11 determines that the first sort of physical column and row comprises at least one expression. 可选的，所述确定单元11，还用于在所述存储单元13将所述第一数据全部存储至所述存储介质中之后，确定查询列；以及所述操作单元12,还用于若所述确定单元11确定的所述查询列为所述第一排序列中的第一个排序列，则根据所述第一个排序列，对所述第一数据进行查询操作。  Alternatively, the determination unit 11 is further configured to, after the storing unit 13 store all the data to the first storage medium, determining a query column; and the operation unit 12, further means for determining if the query 11 determines the sorting as a first sorting of the first column in the column, the column according to the first sort, the first query operation data. 其中，所述操作单元12,具体用于根据所述第一个排序列，在所述本地内存中采用二分查找方式对所述缓存单元10缓存的所述第一数据的一个或多个数据页中的每个数据页进行查询操作。  wherein the operation unit 12, specifically for sorting according to said first column, using a binary search or the way in the cache unit 10 caches data in said first local memory data pages in the data page of each query operation. 可选的，所述确定单元11，还用于在所述存储单元13将所述第一数据全部存储至所述存储介质中之后，确定第二排序列；以及所述操作单元12,还用于若所述确定单元11确定的所述第二排序列为所述第一排序列中的第一个排序列，则根据所述第一个排序列，对所述第一数据进行排序操作。  Alternatively, the determination unit 11 is further configured to, after the storing unit 13 store all the data to the first storage medium, determining a second sort column; and the operation unit 12 further configured to, if the determination unit 11 determines the second ordering of the sorting as a first sorting the first column of the column, the column according to the first sort, the first data sorting operation. 其中，所述操作单元12,具体用于根据所述第一个排序列，在所述本地内存中对所述缓存单元10缓存的所述第一数据进行归并排序。  wherein the operation unit 12, specifically for sorting according to said first column for the merge sort buffer unit 10 buffers the data in said first local memory. 可选的，所述确定单元11，还用于在所述存储单元13将所述第一数据全部存储至所述存储介质中之后，确定聚合列；以及所述操作单元12，还用于若所述确定单元11确定的所述聚合列为所述第一排序列中的第一个排序列，则根据所述第一个排序列，对所述第一数据进行聚合操作，所述聚合操作为在所述第一数据中查找最大值或最小值的操作。  Alternatively, the determination unit 11 is further configured to, after the storing unit 13 store all the data to the first storage medium, the polymerization column is determined; and the operation unit 12, further for determining if the unit 11 determines the first polymerization as a sort column of the first sort column, the column according to the first sort, the first data aggregation operation, the said polymerization is operative to find the maximum or minimum in the operation of the first data. 其中，所述操作单元12,具体用于根据所述第一个排序列，在所述本地内存中确定所述缓存单元10缓存的所述第一数据的一个或多个数据页中的每个数据页中的最大值或最小值，并依次比较所述每个数据页中的最大值或最小值，以确定所述第一数据中的最大值或最小值。  wherein the operation unit 12, specifically for sorting according to said first column, the local memory is determined in one or more of the buffer unit 10 buffers the first data page each data page maximum or minimum, and sequentially comparing each of said maximum or minimum in the data page, to determine the maximum or minimum value of said first data. 其中，所述操作单元12,具体用于将排序后的所述第二数据逐行插入所述创建单元14创建的所述数据表中，以将排序后的所述第二数据聚簇存储至所述存储介质中。  wherein the operation unit 12, specifically for the sorted into said second progressive data creating unit 14 creates the data table to the second data sorted poly cluster stored in the storage medium. 可选的，所述确定单元11确定的所述第一排序列的数量为至少一个，其中，当所述第一排序列的数量为至少两个时，所述至少两个第一排序列包括一个主第一排序列和至少一个次第一排序列。  Alternatively, the determination of the first column of the sorting unit 11 determines the number of at least one, wherein, when the number of the first sort column is at least two, at least two first sorting a first column includes a main column and at least one secondary sort first sort column. 本发明实施例提供一种聚簇存储装置，该聚簇存储装置将待存储的第一数据逐行缓存至数据库系统中的本地内存中，并确定第一排序列，该第一排序列用于对该本地内存中已缓存的数据进行排序，且若本地内存中已缓存的第二数据满足预设条件，该聚簇存储装置则根据该第一排序列对该第二数据进行排序，该第二数据为该第一数据中的已缓存至该本地内存中的数据，以及该聚簇存储装置将排序后的该第二数据聚簇存储至数据库系统中的存储介质中。 Embodiment  The present invention provides a clustered storage means, the clump to be storage means stores a first data row to the database cache in the local memory system, and determining a first sort column, sorting the first column for the local memory buffered data is sorted, and the local memory when the second data buffered meets a preset condition, the poly cluster storage means to the second column of the first sort data according to the sorting the second data is the first data to the data cached in the local memory, and cluster data storage means to the second sorted clustered database system stored in the storage medium. 通过该方案，该聚簇存储装置在将待存储的第一数据逐行缓存至本地内存的过程中，当在本地内存中已缓存的第二数据的数据量超出本地内存允许存储的数据量时，该聚簇存储装置开始根据确定的第一排序列，对该第二数据进行排序，以及将排序后的该第二数据存入数据库系统中的存储介质中，由于可对待存储的数据一部分一部分进行排序并存储，以完成数据的装载，因此，可以保证数据库系统中的存储介质中的数据局部有序，从而能够保证在对数据装载性能和数据更新性能影响较小的同时，提高数据查询性能和数据压缩效率。 When the embodiment, the cluster to be stored in the storage means a first data row to the local cache memory of the process, when the amount of data buffered in the local memory of the second data exceeds the allowable amount of data stored in local memory of , the poly start cluster storing means based on the determined first sorted column, the second sort data, the second and the sorted data into the database system, storage medium, since the data may be stored in a portion of treated sorted and stored in order to complete the loading of data, and therefore, the database system can ensure that the data storage medium local order, thereby ensuring the performance of the data loading and data updating performance less effect while improving data query performance and data compression efficiency. 将待存储的第一数据逐行缓存至所述内存22中，并确定第一排序列，且若在所述内存22中已缓存的第二数据满足预设条件，则根据所述第一排序列，对所述第二数据进行排序，以及将排序后的所述第二数据聚簇存储至所述底层存储介质21中，所述第一排序列用于对所述内存22中已缓存的数据进行排序，所述第二数据为所述第一数据中的已缓存至所述内存22中的数据。  The first data to be stored to the progressive cache memory 22, and determines a first sort column, and if the second data in the cache memory 22 already meets a preset condition, based on the a first sorted column, the second sorting data, and the 21 in the second sorted data stored in the underlying clustered storage medium, the first column is used for sorting in the memory 22 the buffered data is sorted, the second data is the first data to the data cached in the memory 22. 可选的，所述预设条件用于表征所述内存22中已缓存的第二数据的数据量与所述内存22允许存储的数据量之间的关系。  Optionally, the preset condition for characterizing the amount of data buffered in the second data 22 of the memory 22 to the memory to allow the relationship between the amount of data stored. 其中，所述处理器20,具体用于若在所述内存22中已缓存的所述第二数据的行数大于或等于所述第一预设阈值，则根据所述第一排序列对所述第二数据进行排序。  wherein, the processor 20, particularly if used in the cache memory 22 has data of the second number of rows greater than or equal to the first predetermined threshold value, the first sorted the second row of data is sorted. 其中，所述处理器20,具体用于若在所述内存22中已缓存的所述第二数据占用所述内存22的大小大于或等于所述第二预设阈值，则根据所述第一排序列对所述第二数据进行排序。  wherein, the processor 20, particularly if used in the cache memory 22 is occupied by the data of said second memory size is larger than 22 or equal to the second predetermined threshold value, based on the said first column of the second sorting sorts the data. 可选的，所述处理器20,具体用于根据所述第一排序列的数值大小或所述第一排序列的数值的哈希值大小对所述第二数据进行排序。  Optionally, the processor 20, specifically for sorting the data according to the second hash value of the size of numerical size of the first row or the first sorting sort column values. 可选的，所述处理器20,具体用于将排序后的所述第二数据聚簇存储至所述底层存储介质21中的空闲物理块中，所述空闲物理块为除第三数据占用的物理块之外的物理块，所述第三数据为所述第一数据中在所述第二数据之前已聚簇存储至所述底层存储介质21中的数据。  Optionally, the processor 20, 21 in particular for the sorted data of the second cluster to the underlying storage medium storing spare physical block, the spare physical block except for the first physical block other than the three physical block occupied by the data, the third data is the first data have been clustered before the second data storage 21 to the underlying data storage medium. 可选的，所述处理器20确定的所述第一排序列包括物理列和表达式中的至少一个。  Optionally, the processor 20 determines that the first column includes sorting the physical columns and at least one of expressions. 可选的，所述处理器20，还用于在将所述第一数据全部存储至所述底层存储介质21中之后，确定查询列，并判断所述查询列是否为所述第一排序列中的第一个排序列，以及若判断所述查询列为所述第一排序列中的第一个排序列，则根据所述第一个排序列，对所述第一数据进行查询操作，以及输出查询结果。  Optionally, the processor 20 is further configured to store all the data after the first 21 to the underlying storage medium, determining a query row, the query and determines whether the first column a first sorting column sorted column, and if the query is determined as the first column of the first sort sorted column, the column according to the first sort, the first data query operation, and an output query results. 其中，所述处理器20,具体用于根据所述第一个排序列，在所述内存22中采用二分查找方式对所述第一数据的一个或多个数据页中的每个数据页进行查询操作，以及输出所述查询结果。  wherein, the processor 20, specifically for sorting according to said first column, using a binary search mode the first data page or more data in said each memory 22 data page query, and outputting the result of the query. 可选的，所述处理器20，还用于在将所述第一数据全部存储至所述底层存储介质21中之后，确定第二排序列，并判断所述第二排序列是否为所述第一排序列中的第一个排序列，以及若判断所述第二排序列为所述第一排序列中的第一个排序列，则根据所述第一个排序列，对所述第一数据进行排序操作，以及输出排序后的所述第一数据。  Optionally, the processor 20 is further configured to, after all of the first data stored in the storage medium 21 in the bottom layer, the second ordering to determine column and row is determined whether the second ordering sort the first column to the first column sorting, and determining if the second ordering of the sorting as a first sorting the first column in the column, the column based on the first sort of said first data sorting operations, sorting and outputting the first data. 其中，所述处理器20，具体用于根据所述第一个排序列，在所述内存22中对所述第一数据进行归并排序，并输出排序后的所述第一数据。  wherein, the processor 20, specifically for sorting according to said first column for the merge sort in said first data memory 22, and outputs the sorted data first. 可选的，所述处理器20，还用于在将所述第一数据全部存储至所述底层存储介质21中之后，确定聚合列，并判断所述聚合列是否为所述第一排序列中的第一个排序列，以及若判断所述聚合列为所述第一排序列中的第一个排序列，则根据所述第一个排序列，对所述第一数据进行聚合操作，以及输出进行聚合操作的结果，所述聚合操作为在所述第一数据中查找最大值或最小值的操作。  Optionally, the processor 20 is further configured to, after all of the first data stored in the storage medium 21 in the bottom layer, the polymerization column is determined, and the determination whether the second polymerization column a first sorting column sorted column, and if polymerization is determined as the first column of the first sort sorted column, the column according to the first sort, the first data operation results of the polymerization, the polymerization and the output operation, the polymerization is operative to find the maximum or minimum in the operation of the first data. 其中，所述处理器20，具体用于根据所述第一个排序列，在所述内存22中确定所述第一数据的一个或多个数据页中的每个数据页中的最大值或最小值，并依次比较所述每个数据页中的最大值或最小值，以确定所述第一数据中的最大值或最小值，以及输出所述最大值或最小值。  wherein, the processor 20, specifically for sorting according to said first column, in the memory 22 to determine one or more pages of data in the first data in each data page maximum or minimum value, and sequentially comparing each of said maximum or minimum in the data page, to determine the first maximum or minimum data, and outputting the maximum or minimum value. 其中，所述处理器20,具体用于将排序后的所述第二数据逐行插入所述数据表中， 以将排序后的所述第二数据聚簇存储至所述底层存储介质21中。  wherein, the processor 20, specifically for the sorted data into said second data table row, the sorted to the second data stored in the underlying clustered storage medium 21. 可选的，所述处理器20确定的所述第一排序列的数量为至少一个，其中，当所述第一排序列的数量为至少两个时，所述至少两个第一排序列包括一个主第一排序列和至少一个次第一排序列。 Number of columns of the first sorting  Optionally, the processor 20 determines at least one, wherein, when the number of the first sort column is at least two, at least two first sorting a first column includes a main column and at least one secondary sort first sort column. 本发明实施例中，计算机节点可以为计算机，也可以为其他任意能够对数据进行聚簇存储的设备，本发明不做限制。 Embodiment  In the present invention, the computer may be a computer node, or may be any other device capable of storing the data of the cluster, it is not limited in the present invention. 即能够实现本发明实施例提供的聚簇存储方法的装置和设备都在本发明的保护范围之内。 Systems and equipment, i.e. clustered storage method can be realized according to an embodiment of the present invention are within the scope of the present invention. 本发明实施例提供一种数据库系统，该数据库系统中的计算机节点将待存储的第一数据逐行缓存至该数据库系统中的内存中，并确定第一排序列，该第一排序列用于对该内存中已缓存的数据进行排序，且若该内存中已缓存的第二数据满足预设条件，该计算机节点则根据该第一排序列对该第二数据进行排序，该第二数据为该第一数据中的已缓存至该内存中的数据，以及该计算机节点将排序后的该第二数据聚簇存储至数据库系统中的底层存储介质中。  The present invention provides a database system, a computer system node in the database to be stored in the first data row to the cache memory in the system database, and determining a first sort column, sorting the first column for the data cached in memory ordering, and the second memory if the data buffered meets a preset condition, that the second computer node of the column to sort the data according to the first order, and the second second data is the first data to the data that has been cached in memory, and the second node computer sorted data stored in the clustered database system underlying storage medium. 通过该方案，该计算机节点在将待存储的第一数据逐行缓存至内存的过程中，当在内存中已缓存的第二数据的数据量超出内存允许存储的数据量时，该计算机节点开始根据确定的第一排序列，对该第二数据进行排序，以及将排序后的该第二数据存入该底层存储介质中，由于可对待存储的数据一部分一部分进行排序并存储，以完成数据的装载，因此，可以保证数据库系统中的底层存储介质中的数据局部有序，从而能够保证在对数据装载性能和数据更新性能影响较小的同时，提高数据查询性能和数据压缩效率。 By this process embodiment, the computer node to be stored in the first data row to the cache memory, the data in memory when the amount of buffered data exceeds a second amount of memory allows data storage, the node starts the computer a first sorted according to the determined row, the second sort data, the second and the sorted data into the underlying storage medium, since a portion of the stored data to be sorted and stored in order to complete the data loading, therefore, the database system can ensure that the data storage medium underlying the local order, thereby ensuring the performance of the data loading and data updating performance less effect while improving data compression efficiency of the data and query performance. 为了更加清楚地了解本发明实施例提供的聚簇存储方法，下面以一个具体的实例来进一步说明本发明实施例提供的聚簇存储方法。  In order to more clearly understand clustered storage method provided in the embodiment of the present invention, a specific example below to further illustrate clustered storage method according to an embodiment of the present invention. 如图8所示，假设待存储的第一数据为9000000行学生数据，具体每行数据表示每个学生的相关信息，如图9所示的班级、学号、姓名等。 8, assuming that the first data to be stored as student data 9,000,000 row, each row representing each particular student's information, the class shown in Figure 9, number, name and the like. 需要说明的是，如图9所示，A表示未排序前的数据;B表示采用本发明实施例提供的聚簇存储方法排序并存储后的数据。  Incidentally, as shown in FIG. 9, A indicates data before unsorted; B represents data using stored clustering sorting method according to an embodiment of the present invention is stored. (1)计算机节点将待存储的学生数据逐行缓存至数据库系统中的本地内存中。 Student data  (1) to be stored in a computer node to a cache row of the database system local memory. (2)计算机节点确定第一排序列为班级和学号，其中，该第一排序列用于对该本地内存中已缓存的学生数据进行排序，该排序列为用户根据实际需求指定的。  (2) determining a first computer node and ordered as a school class number, wherein the first column is used to sort the student data buffered in the local memory to sort, according to the ranking as the actual needs of the user designates of. (3)若该本地内存中已缓存的学生数据满足本发明实施例提供的预设条件，计算机节点则根据学生的班级和序号，对该本地内存中已缓存的学生数据进行排序。  (3) If the student data buffered in the local memory of the present invention satisfies a preset condition according to an embodiment, the computer node number and the student's class, the cached in local memory of the student data sorted. (4)计算机节点将该本地内存中排序后的学生数据聚簇存储至数据库系统中的存储介质中。  (4) The student computer node local memory data sort stored in the clustered database system storage medium. ⑸计算机节点循环执行（1) - (4)，直至将待存储的所有学生数据一部分一部分地全部排序并存储至该存储介质中。  ⑸ execution cycle computer node (1) - a portion of all of the student data (4), to be stored until all the sorted and stored in the storage medium. 示例性的，如图9所示的A中，待存储的学生数据有12行，并且这12行学生数据都是无序存储的，采用本发明实施例提供的聚簇存储方法存储该学生数据时，计算机节点可从第一行学生数据开始，将这些学生数据逐行缓存至数据库系统中的本地内存中，假设该本地内存每次只能缓存6行学生数据，则当计算机节点在该本地内存中已缓存有6行学生数据时，计算机节点可对该6行学生数据进行排序，并将排序后的该6行学生数据聚簇存储至数据库系统中的存储介质中，如图9的Bl部分所示。  Exemplary, A shown in FIG. 9, the student data to be stored in row 12, row 12 and the student data which are stored unordered, embodiment of the present invention provides a method of storing the cluster storage when the student data, the computer may begin a first node from a data line of the student, the student data to the cache line by line to the local memory in a database system, it is assumed that the local cache memory can only student data line 6, when the computer node when there has been a cache line 6 in the student data in the local memory, the computer can sort the nodes student data line 6, the line 6 and student data stored in the database sorted clustered system storage medium, FIG. Bl portion 9 as shown. 计算机节点将这6行学生数据存储完成后， 计算机节点可继续逐行缓存其余的6行学生数据至该本地内存中，并在缓存完成后对该其余的6行学生数据进行排序，以及将排序后的该其余的6行学生数据聚簇存储至该存储介质中，如图9的B2部分所示，至此，计算机节点将待存储的12行学生数据全部聚簇存储至该存储介质中，且该12行学生数据在该存储介质中为局部有序存储，如图9的B所示。 After these six lines of computer nodes student data storage is complete, the computer node can continue the rest of the progressive cache line 6 student data to the local memory, and sort the remaining six rows student data in the cache is completed, and the sort after the remaining 6 rows student data clustered into the storage medium, B2 portion shown in Figure 9, thus, the computer node 12 to be stored in the student data row all clustered into the storage medium, and the student data line 12 in the storage medium for storing local order, as shown in FIG. 9 B. 进一步地，计算机节点在缓存学生数据时，也可按照该本地内存的大小缓存该学生数据，具体的，若计算机节点某一次缓存的某些行的学生数据较大，则计算机节点该次缓存的学生数据的行数则相对较少;相反的，若计算机节点某一次缓存的某些行的学生数据较小，则计算机节点该次缓存的学生数据的行数则相对较多，具体计算机节点缓存的学生数据的大小可由实际情况而定，本发明不作限制。  Further, when the buffer node computer the student data, the student data can be cached in accordance with the size of the local memory, specifically, the student data cache if a computer node of a certain line is large, the computer node times the number of lines is relatively small cache of student data; the contrary, if the student data in a computer node of a certain cache line is small, then the sub-node computer student data cache line number is relatively large, concrete computer node cache size student data may be the actual situation, the present invention is not limited. 本发明实施例提供的聚簇存储方法中，计算机节点可根据数据库系统中的本地内存的处理能力逐行缓存待存储的数据，且当在该本地内存中缓存的部分数据超出本地内存的处理能力时，该计算机节点可开始根据确定的用户指定的排序列，对该部分数据进行排序，以及将排序后的该部分数据存入数据库系统中的存储介质中，由于该计算机节点可对待存储的数据一部分一部分进行排序并存储，以完成数据的装载，因此，可以保证该存储介质中的数据局部有序，从而能够保证在对数据装载性能和数据更新性能影响较小的同时， 提高数据查询性能和数据压缩效率。 Clustered storage method according to an embodiment of the  present invention, a computer node may be stored row data cache according to the local memory database system processing power, and when the portion of the data cached in the local memory in local memory exceeds the processing capacity of the computer can start the specified node according to the determined user sorted column, sort the data portion, and the portion of the sorted data into the database system, storage medium, since the computer can treat node a portion of the stored data sorted and stored in order to complete the loading of data, and therefore, can ensure that the data storage medium local order, thereby ensuring the performance of the data loading and data updating performance less effect while improving data query performance and data compression efficiency. 所属领域的技术人员可以清楚地了解到，为描述的方便和简洁，仅以上述各功能模块的划分进行举例说明，实际应用中，可以根据需要而将上述功能分配由不同的功能模块完成，即将装置的内部结构划分成不同的功能模块，以完成以上描述的全部或者部分功能。  Those skilled in the art may clearly understand that, for convenience and brevity of description, only the division of the functional modules is illustrated, in practice, according to the necessity foregoing functions by different functional modules completed, the internal structure of the apparatus is divided into different functional modules to complete all or part of the functions described above. 上述描述的系统，装置和单元的具体工作过程，可以参考前述方法实施例中的对应过程，在此不再赘述。 Specific working process of the foregoing system, apparatus, and unit, reference may be the corresponding process in the method embodiment, which is not repeated herein. 在本申请所提供的几个实施例中，应该理解到，所揭露的系统，装置和方法，可以通过其它的方式实现。  In several embodiments provided herein present embodiment, it should be understood that the system, apparatus and method disclosed may be implemented in other manners. 例如，以上所描述的装置实施例仅仅是示意性的，例如，所述模块或单元的划分，仅仅为一种逻辑功能划分，实际实现时可以有另外的划分方式，例如多个单元或组件可以结合或者可以集成到另一个系统，或一些特征可以忽略，或不执行。 For example, the described apparatus embodiments are merely illustrative of, e.g., the module or unit division is merely logical function division, there may be other division in actual implementation, a plurality of units or components may e.g. be combined or integrated into another system, or some features may be ignored or not performed. 另一点，所显示或讨论的相互之间的耦合或直接耦合或通信连接可以是通过一些接口，装置或单元的间接耦合或通信连接，可以是电性，机械或其它的形式。 Another point, displayed or coupling or direct coupling or communication between interconnected in question may be through some interface, device, or indirect coupling or communication connection unit, may be electrical, mechanical, or other forms. 所述集成的单元如果以软件功能单元的形式实现并作为独立的产品销售或使用时，可以存储在一个计算机可读取存储介质中。  If the integrated unit is realized as an independent product sold or used in the form of a software functional unit may be stored in a computer-readable storage medium. 基于这样的理解，本发明的技术方案本质上或者说对现有技术做出贡献的部分或者该技术方案的全部或部分可以以软件产品的形式体现出来，该计算机软件产品存储在一个存储介质中，包括若干指令用以使得一台计算机设备(可以是个人计算机，服务器，或者网络设备等)或处理器(processor)执行本发明各个实施例所述方法的全部或部分步骤。 Based on such understanding, the technical solutions of the present invention essentially, or the part or all of the technical solutions contributing to the prior art may be embodied in part or in the form of a software product, which computer software product is stored in a storage medium , including several instructions for instructing a computer device (may be a personal computer, a server, or network device) or (processor) to perform all or part of the steps of the methods of the various embodiments of the present invention. 而前述的存储介质包括:U盘、移动硬盘、只读存储器(R0M，Read_0nly Memory)、随机存取存储器(RAM，Random Access Memory)、磁碟或者光盘等各种可以存储程序代码的介质。 The storage medium includes: U disk, mobile hard disk, a read-only memory (R0M, Read_0nly Memory), a random access various memories (RAM, Random Access Memory), a magnetic disk, or an optical medium can store program codes. 1. 一种聚簇存储方法，应用于数据库系统中，其特征在于，在将待存储到所述数据库系统的第一数据存储到所述数据库系统的存储介质中时，包括： 将待存储的第一数据的一部分缓存至所述数据库系统中的本地内存中； 若所述本地内存中已缓存的第二数据满足预设条件，则根据获取的第一排序列对所述第二数据进行排序，所述第二数据为所述第一数据中的已缓存至所述本地内存中的数据； 将排序后的所述第二数据聚簇存储至所述数据库系统中的存储介质中； 重复执行上述三个步骤，直至将所述第一数据全部存储至所述数据库系统的存储介质中，所述存储介质中存储的第一数据包括多个局部有序的第二数据。 A cluster storage method, applied to the database system, wherein, in the first data to be stored into the database system stored in the storage medium to the database system, comprising: to be stored a first portion of the cached data to the local memory database system; a second local memory if the data buffered meets a preset condition, then the second column to sort the data of the acquired first ordering the second data is the first data to the data cached in the local memory; the second sorted data stored in the clustered database system storage medium; repeatedly performed the above three steps until all the data stored in said first storage medium of the database system, the first data stored in said storage medium comprises a plurality of second local order data. 2. 根据权利要求1所述的聚簇存储方法，其特征在于， 所述预设条件用于表征所述本地内存中已缓存的第二数据的数据量与所述本地内存允许存储的数据量之间的关系。 The clustered storage method according to claim 1, wherein said predetermined condition for characterizing the data amount of local memory data is cached in the second local memory allows the stored The relationship between. 3. 根据权利要求1或2所述的聚簇存储方法，其特征在于，所述预设条件为所述第二数据的行数大于或等于第一预设阈值， 其中，所述若所述本地内存中已缓存的第二数据满足预设条件，则根据获取的第一排序列对所述第二数据进行排序，具体包括： 若所述第二数据的行数大于或等于所述第一预设阈值，则根据所述第一排序列对所述第二数据进行排序。 The clustered storage method as claimed in claim 1 or 2, wherein said predetermined condition is the number of rows of the second data is greater than or equal to a first predetermined threshold, wherein, if the said a second local memory data buffered meets a preset condition, then the second column to sort the data of the acquired first ordering comprises: if the second number of data lines greater than or equal to the first preset threshold value, according to the first column of the second sorting sorts the data. 4. 根据权利要求1或2所述的聚簇存储方法，其特征在于，所述预设条件为所述第二数据占用所述本地内存的大小大于或等于第二预设阈值， 其中，所述若所述本地内存中已缓存的第二数据满足预设条件，则根据获取的第一排序列对所述第二数据进行排序，具体包括： 若所述第二数据占用所述本地内存的大小大于或等于所述第二预设阈值，则根据所述第一排序列对所述第二数据进行排序。 The clustered storage method of claim 1 or claim 2, wherein said second predetermined condition is that the data occupancy of the local memory size equal to or greater than a second predetermined threshold value, wherein the if the said second local memory data buffered meets a preset condition, then the second column to sort the data of the acquired first ordering comprises: if the second data occupying the local memory size equal to or greater than the second predetermined threshold value, the second column of the data is sorted according to the first ordering. 5. 根据权利要求1或2所述的聚簇存储方法，其特征在于，所述根据获取的第一排序列对所述第二数据进行排序，具体包括： 根据所述第一排序列的数值大小或所述第一排序列的数值的哈希值大小对所述第二数据进行排序。 The clustered storage method of claim 1 or claim 2, wherein said second row of said first sorting to sort the data acquired, comprises: a first ordered according to the value of the column the size of the hash value or size of the first sort column values ​​of the second data sorting. 6. 根据权利要求1或2所述的聚簇存储方法，其特征在于，所述将排序后的所述第二数据聚簇存储至所述数据库系统中的存储介质中，具体包括： 将排序后的所述第二数据聚簇存储至所述存储介质中的空闲物理块中，所述空闲物理块为除第三数据占用的物理块之外的物理块，所述第三数据为所述第一数据中在所述第二数据之前已聚簇存储至所述存储介质中的数据。 The clustered storage method according to claim 1, characterized in that the said second data sorted clustered database system stored in the storage medium, comprises: a sorting after the second data stored in the cluster storage medium free physical block, the spare physical block as a physical block other than the third physical block occupied by the data, the third data is the a first data before said second data is stored clustering data to the storage medium. 7. 根据权利要求1或2所述的聚簇存储方法，其特征在于， 所述第一排序列包括物理列和表达式中的至少一个。 The clustered storage method of claim 1 or claim 2, wherein said column includes sorting the first column and the physical expression of at least one. 8. 根据权利要求1或2所述的聚簇存储方法，其特征在于，在所述第一数据全部存储至所述存储介质中之后，所述方法还包括： 确定查询列； 若所述查询列为所述第一排序列中的第一个排序列，则根据所述第一个排序列，对所述第一数据进行查询操作。 The clustered storage method as claimed in claim 1 or 2, characterized in that, after all of the data stored in said first storage medium, said method further comprising: determining a query column; if the query as a sort of the first column of the first row of sorting, the sorting according to said first column, the first query operation data. 9. 根据权利要求8所述的聚簇存储方法，其特征在于，所述确定查询列之后，根据所述第一个排序列，对所述第一数据进行查询操作之前，所述方法还包括： 将所述存储介质中存储的所述第一数据读入所述本地内存中； 其中，所述根据所述第一个排序列，对所述第一数据进行查询操作，具体包括： 根据所述第一个排序列，在所述本地内存中采用二分查找方式对所述第一数据的一个或多个数据页中的每个数据页进行查询操作。 Clustered storage method according to claim 8, characterized in that, after the query before determining the column, according to the first sort column, the first query operation data, said method further comprising : the storage medium storing the first data read into the local memory; wherein said sorting according to said first column, the first query operation data comprises: according to the said first sorting column, using a binary search mode in the local memory of the first data to a plurality of data pages or data page for each query. 10. 根据权利要求1或2所述的聚簇存储方法，其特征在于，在所述第一数据全部存储至所述存储介质中之后，所述方法还包括： 获取第二排序列； 若所述第二排序列为所述第一排序列中的第一个排序列，则根据所述第一个排序列， 对所述第一数据进行排序操作。 10. The clustered storage method according to claim 1, wherein, after all data in the first storage to the storage medium, the method further comprising: obtaining a second sort column; if the said second sorting as a first sorting the first column of the sorted column, the column according to the first sort, the sorting operation for the first data. 11. 根据权利要求10所述的聚簇存储方法，其特征在于，所述获取第二排序列之后，根据所述第一个排序列，对所述第一数据进行排序操作之前，所述方法还包括： 将所述存储介质中存储的所述第一数据读入所述本地内存中； 其中，所述根据所述第一个排序列，对所述第一数据进行排序操作，具体包括： 根据所述第一个排序列，在所述本地内存中对所述第一数据进行归并排序。 Clustered storage method according to claim 10, characterized in that, prior to the second column after sorting, sorting according to said first column of said first data sorting operation, the method of obtaining the further comprising: said storage medium stores a first data read into the local memory; wherein, the first data sorting operation according to the first sort column, comprises: a column based on the first sort, merge sort for the first data in the local memory. 12. 根据权利要求1或2所述的聚簇存储方法，其特征在于，在所述第一数据全部存储至所述存储介质中之后，所述方法还包括： 确定聚合列； 若所述聚合列为所述第一排序列中的第一个排序列，则根据所述第一个排序列，对所述第一数据进行聚合操作，所述聚合操作为在所述第一数据中查找最大值或最小值的操作。 12. The clustered storage method according to claim 1, wherein, after all of the data stored in said first storage medium, said method further comprising: determining a polymerization column; if the polymeric sorting as a first sorting of the first column in the column, the column according to the first sort, the first operation data polymerization, the polymerization operation to find the maximum in said first data minimum value or operation. 13. 根据权利要求12所述的聚簇存储方法，其特征在于，所述确定聚合列之后，根据所述第一个排序列，对所述第一数据进行聚合操作之前，所述方法还包括： 将所述存储介质中存储的所述第一数据读入所述本地内存中； 其中，所述根据所述第一个排序列，对所述第一数据进行聚合操作，具体包括： 根据所述第一个排序列，在所述本地内存中确定所述第一数据的一个或多个数据页中的每个数据页中的最大值或最小值； 依次比较所述每个数据页中的最大值或最小值，以确定所述第一数据中的最大值或最小值。 Clustered storage method according to claim 12, wherein said polymerization column after before determining, based on the first column of a sort, the first polymerization operation data, said method further comprising : the said storage medium is stored in a first data read into the local memory; wherein said sorting according to said first column of said first data aggregation operation comprises: according to the sorting said first column, to determine maximum or minimum value of one or more pages of data in the first data in each data page in said local memory; sequentially comparing each of said data page maximum or minimum, in order to determine the maximum or minimum value of the first data. 14. 根据权利要求1所述的聚簇存储方法，其特征在于，所述将待存储的第一数据的一部分缓存至所述数据库系统中的本地内存中之前，所述方法还包括： 在所述存储介质中创建数据表，所述数据表用于装载所述第一数据； 其中，所述将排序后的所述第二数据聚簇存储至所述数据库系统中的存储介质中，具体包括： 将排序后的所述第二数据逐行插入所述数据表中，以将排序后的所述第二数据聚簇存储至所述存储介质中。 14. The clustering of the storage method as claimed in claim 1, wherein the first portion of the cache data to be stored prior to the local memory in a database system, the method further comprising: in the said storage medium to create a data table, the data table for loading said first data; wherein, the second sorted the data stored in the clustered database system storage medium, comprises : the sorted data into said second data table row, the sorted to the second data stored in the cluster storage medium. 15. —种聚簇存储装置，应用于数据库系统中，其特征在于，在将待存储到所述数据库系统的第一数据存储到所述数据库系统的存储介质中时，包括： 缓存单元，用于将待存储的第一数据一部分一部分的分别缓存至所述数据库系统中的本地内存中； 确定单元，用于获取第一排序列，所述第一排序列用于对所述本地内存中已缓存的数据进彳丁排序； 操作单元，用于若所述缓存单元在所述本地内存中已缓存的第二数据满足预设条件， 则根据所述确定单元获取的所述第一排序列，对所述第二数据进行排序，所述第二数据为所述第一数据中的已缓存至所述本地内存中的数据； 存储单元，用于重复执行将所述操作单元排序后的所述第二数据聚簇存储至所述数据库系统中的存储介质中。 15. - Species clustered storage means, applied to the database system, wherein, in said database to be stored in the first data storage system to the storage medium of the database system, comprising: a buffer unit, with the data to be stored in the first cache respectively to a portion of the local memory database system; determining unit, configured to obtain a first sort column, sorting the first column has been used for the local memory stimulation was cached data sorting butoxy; operating unit, a second data unit if the buffer in the local memory buffered meets a preset condition, according to the determined row obtained by the first sorting unit, sorting said second data, said second data is the first data to the data cached in the local memory; storing means for repeatedly performing the operation after the sorting unit storing second data for a clustered database system to the storage medium. 16. 根据权利要求15所述的聚簇存储装置，其特征在于， 所述预设条件用于表征所述本地内存中已缓存的第二数据的数据量与所述本地内存允许存储的数据量之间的关系。 Clustered storage device according to claim 15, wherein said predetermined condition for characterizing the amount of data buffered in the local memory of the second data with the allowable amount of local memory data storage The relationship between. 17. 根据权利要求15或16所述的聚簇存储装置，其特征在于，所述预设条件为所述第二数据的行数大于或等于第一预设阈值， 其中，所述操作单元，具体用于若所述第二数据的行数大于或等于所述第一预设阈值， 则根据所述第一排序列对所述第二数据进行排序。 17. The storage device 15 or clustered according to claim 16, wherein said predetermined condition is the number of rows of the second data is equal to or greater than a first predetermined threshold value, wherein said operation unit, specifically, if the number of lines for the second data is greater than or equal to the first predetermined threshold value, the second column of the data is sorted according to the first ordering. 18. 根据权利要求15或16所述的聚簇存储装置，其特征在于，所述预设条件为所述第二数据占用所述本地内存的大小大于或等于第二预设阈值， 其中，所述操作单元，具体用于若所述第二数据占用所述本地内存的大小大于或等于所述第二预设阈值，则根据所述第一排序列对所述第二数据进行排序。 18. The storage device 15 or clustered according to claim 16, wherein said second predetermined condition is that the data occupancy of the local memory size equal to or greater than a second predetermined threshold value, wherein the said operation unit, for if the specific second data occupying the local memory size is larger or equal to the second predetermined threshold value, the second column of the data is sorted according to the first ordering. 19. 根据权利要求15或16所述的聚簇存储装置，其特征在于， 所述操作单元，具体用于根据所述确定单元获取的所述第一排序列的数值大小或所述第一排序列的数值的哈希值大小对所述第二数据进行排序。 19. The cluster storage apparatus as claimed in claim 15 or 16, characterized in that the operating unit is configured according to the determined numerical values ​​of the acquired first sorting unit or the first row ordering the size of the hash value of the value of the second column to sort the data. 20. 根据权利要求15或16所述的聚簇存储装置，其特征在于， 所述存储单元，具体用于将所述操作单元排序后的所述第二数据聚簇存储至所述存储介质中的空闲物理块中，所述空闲物理块为除第三数据占用的物理块之外的物理块，所述第三数据为所述第一数据中在所述第二数据之前已聚簇存储至所述存储介质中的数据。 20. The storage device 15 or clustered according to claim 16, wherein the storage unit, in particular for the sorting after the second operation unit to store the data for a clustered storage medium spare physical block, the spare physical block as a physical block other than the third physical block occupied by the data, the third data is the first data already clustered in the second data storage prior to said data storage medium. 21. 根据权利要求15或16所述的聚簇存储装置，其特征在于， 所述确定单元获取的所述第一排序列包括物理列和表达式中的至少一个。 21. Clustered storage device of claim 15 or claim 16, wherein said determining unit acquires the first column includes sorting the physical columns and at least one of expressions. 22. 根据权利要求15或16所述的聚簇存储装置，其特征在于， 所述确定单元，还用于在所述存储单元将所述第一数据全部存储至所述存储介质中之后，确定查询列； 所述操作单元，还用于若所述确定单元确定的所述查询列为所述第一排序列中的第一个排序列，则根据所述第一个排序列，对所述第一数据进行查询操作。 22. The storage device 15 or clustered according to claim 16, wherein said determining means further for storing said unit after the first data are all stored into the storage medium, determining query column; the operation unit is further configured to, if the determination unit determines the query as a first column of said first sort sorted column, the column according to the first sort, the The first data query operation. 23. 根据权利要求22所述的聚簇存储装置，其特征在于， 所述缓存单元，还用于在所述确定单元确定所述查询列之后，所述操作单元根据所述第一个排序列，对所述第一数据进行查询操作之前，将所述存储介质中存储的所述第一数据读入所述本地内存中； 其中，所述操作单元，具体用于根据所述第一个排序列，在所述本地内存中采用二分查找方式对所述缓存单元缓存的所述第一数据的一个或多个数据页中的每个数据页进行查询操作。 23. The cluster storage apparatus according to claim 22, wherein the buffer unit is further configured, after the determining unit determines the query column, the operating unit according to the first sort column before the first query operation on the data, the storage medium stores said first read data into the local memory; wherein the operation unit is configured according to the first sort column, using a binary search mode in said local memory to a buffer of the buffer unit to the first data page or more data pages for each of the query data. 24. 根据权利要求15或16所述的聚簇存储装置，其特征在于， 所述确定单元，还用于在所述存储单元将所述第一数据全部存储至所述存储介质中之后，获取第^排序列； 所述操作单元，还用于若所述确定单元获取的所述第二排序列为所述第一排序列中的第一个排序列，则根据所述第一个排序列，对所述第一数据进行排序操作。 24. The storage device 15 or clustered according to claim 16, wherein said determining means is further configured in the storage unit storing all the data to the first storage medium after acquiring ^ the first sort column; the operation unit if the determination unit is further configured to obtain the second ordering of the sorting as a first sorting of the first column in the column, the column according to the first sort , the first data sorting operation. 25. 根据权利要求24所述的聚簇存储装置，其特征在于， 所述缓存单元，还用于在所述确定单元获取所述第二排序列之后，所述操作单元根据所述第一个排序列，对所述第一数据进行排序操作之前，将所述存储介质中存储的所述第一数据读入所述本地内存中； 其中，所述操作单元，具体用于根据所述第一个排序列，在所述本地内存中对所述缓存单元缓存的所述第一数据进行归并排序。 25. The cluster storage device according to claim 24, wherein the buffer unit is further configured to, after the second determining unit acquires the sort column, the first operating unit according to the sort column, before sorting operation on the first data, the storage medium stores said first read data into the local memory; wherein the operation unit is configured according to the first sort column, a merge sort buffer in the cache unit of the first data in said local memory. 26. 根据权利要求15或16所述的聚簇存储装置，其特征在于， 所述确定单元，还用于在所述存储单元将所述第一数据全部存储至所述存储介质中之后，确定聚合列； 所述操作单元，还用于若所述确定单元确定的所述聚合列为所述第一排序列中的第一个排序列，则根据所述第一个排序列，对所述第一数据进行聚合操作，所述聚合操作为在所述第一数据中查找最大值或最小值的操作。 26. The storage device 15 or clustered according to claim 16, wherein said determining means further for storing said unit after the first data are all stored into the storage medium, determining polymerization column; the operation unit is further configured to, if the determination unit determines the first polymerization as a sort column of the first sort column, the column according to the first sort, the the first operation data polymerization, the polymerization operation is to find the maximum or minimum in the first operation data. 27. 根据权利要求26所述的聚簇存储装置，其特征在于， 所述缓存单元，还用于在所述确定单元确定所述聚合列之后，所述操作单元根据所述第一个排序列，对所述第一数据进行聚合操作之前，将所述存储介质中存储的所述第一数据读入所述本地内存中； 其中，所述操作单元，具体用于根据所述第一个排序列，在所述本地内存中确定所述缓存单元缓存的所述第一数据的一个或多个数据页中的每个数据页中的最大值或最小值，并依次比较所述每个数据页中的最大值或最小值，以确定所述第一数据中的最大值或最小值。 27. Clustered storage device according to claim 26, wherein the buffer unit is further configured, after the determining unit determines said polymerization column, said first operating unit according to the sort column before polymerization operation on the first data, the storage medium stores said first read data into the local memory; wherein the operation unit is configured according to the first sort column, determine the maximum or minimum of the first data buffer unit to buffer the one or more pages of data in each data page in said local memory, and sequentially comparing each of said data page the maximum or minimum, in order to determine the maximum or minimum value of the first data. 28. 根据权利要求15所述的聚簇存储装置，其特征在于，所述聚簇存储装置还包括创建单元， 所述创建单元，用于在所述缓存单元将待存储的第一数据一部分一部分的分别缓存至所述数据库系统中的本地内存中之前，在所述存储介质中创建数据表，所述数据表用于装载所述第一数据； 其中，所述操作单元，具体用于将排序后的所述第二数据逐行插入所述创建单元创建的所述数据表中，以将排序后的所述第二数据聚簇存储至所述存储介质中。 28. Clustered storage device according to claim 15, wherein said apparatus further comprises a storage cluster creating unit, the creating unit, a first data unit in the buffer to be stored in a portion of respectively, prior to the cache database in the local memory system, the storage medium is created in the data table, the data table for loading said first data; wherein said operation unit is specifically configured to sort after the second data creation unit creates the progressive insertion of said data table, to the second sorted data stored in the cluster storage medium. 29. —种数据库系统，其特征在于，在将待存储到所述数据库系统的第一数据存储到所述数据库系统的存储介质中时，包括： 底层存储介质； 内存，耦合至所述底层存储介质，用于作为所述底层存储介质的缓存； 处理器，耦合至所述内存，所述处理器执行所述内存中的指令，用于： 将待存储的第一数据一部分一部分的分别缓存至所述内存中，并获取第一排序列，且重复执行:若所述内存中已缓存的第二数据满足预设条件，则根据所述第一排序列对所述第二数据进行排序，以及将排序后的所述第二数据聚簇存储至所述底层存储介质中，所述第一排序列用于对所述内存中已缓存的数据进行排序，所述第二数据为所述第一数据中的已缓存至所述内存中的数据。 29. - kind of database system, wherein, in said database to be stored in the first data storage system to the storage medium of the database system, comprising: an underlying storage medium; memory coupled to the underlying storage medium as a cache for the underlying storage medium; a processor coupled to the memory, the processor executes instructions in the memory, configured to: a first buffer data to be stored, respectively to a portion of said memory, and acquires the first sort column, and repeatedly executed: if said second memory data buffered meets a preset condition, sorting the data according to the first ordering second row, and the sorted cluster storing the second data storage medium to the bottom of the first column is used for sorting the sort data is cached in memory, the second data is the first the cached data to said data memory. 30. 根据权利要求29所述的数据库系统，其特征在于， 所述预设条件用于表征所述内存中已缓存的第二数据的数据量与所述内存允许存储的数据量之间的关系。 30. A database system according to claim 29, wherein the predetermined relationship between the amount of data used to characterize the condition of the second data in said memory and the amount of buffered data stored in memory allows . 31. 根据权利要求29或30所述的数据库系统，其特征在于，所述预设条件为所述第二数据的行数大于或等于第一预设阈值， 其中，在所述若所述内存中已缓存的第二数据满足预设条件，则根据所述第一排序列对所述第二数据进行排序的方面，所述处理器具体用于若所述第二数据的行数大于或等于所述第一预设阈值，则根据所述第一排序列对所述第二数据进行排序。 31. The database system of claim 29 or claim 30, wherein said predetermined condition is the number of rows of the second data is greater than or equal to a first predetermined threshold, wherein, in said memory if said the second data buffered meets a preset condition, based on the first column of the second ordering data for ordering aspect, the processor is specifically the number of lines if the second data is greater than or equal to the first predetermined threshold value, according to the first column of the second sorting sorts the data. 32. 根据权利要求29或30所述的数据库系统，其特征在于，所述预设条件为所述第二数据占用所述内存的大小大于或等于第二预设阈值， 其中，在所述若所述内存中已缓存的第二数据满足预设条件，则根据所述第一排序列对所述第二数据进行排序的方面，所述处理器具体用于若所述第二数据占用所述内存的大小大于或等于所述第二预设阈值，则根据所述第一排序列对所述第二数据进行排序。 32. The database system of claim 29 or claim 30, wherein said second predetermined condition is that the data occupies the memory size is greater than or equal to a second predetermined threshold, wherein, if the the second memory data buffered meets a preset condition, based on the first column of the second ordering data for ordering aspect, the processor is configured to, if the specific second data occupying the memory size is greater than or equal to the second predetermined threshold value, the second column of the data is sorted according to the first ordering. 33. 根据权利要求29或30所述的数据库系统，其特征在于， 在所述根据所述第一排序列对所述第二数据进行排序的方面，所述处理器具体用于根据所述第一排序列的数值大小或所述第一排序列的数值的哈希值大小对所述第二数据进行排序。 33. The database system of claim 29 or claim 30, wherein, in the first aspect according to the ordering of the second row of sorting data, the processor is configured based on the first a sorting numerical value of the size of the hash value or size of the column of the first row of the second sorting sorts the data. 34. 根据权利要求29或30所述的数据库系统，其特征在于， 在所述将排序后的所述第二数据聚簇存储至所述底层存储介质中的方面，所述处理器，具体用于将所述第二数据聚簇存储至所述底层存储介质中的空闲物理块中，所述空闲物理块为除第三数据占用的物理块之外的物理块，所述第三数据为所述第一数据中在所述第二数据之前已聚簇存储至所述底层存储介质中的数据。 34. The database system of claim 29 or claim 30, wherein, in the second the sorted data stored in the underlying clustered storage medium aspect, the processor, particularly with in the second data storage clustering to the underlying storage medium of free physical block, the spare physical block as a physical block other than the third physical block occupied by the data, the third data being said first data have been clustered into the underlying storage data storage medium prior to the second data. 35. 根据权利要求29或30所述的数据库系统，其特征在于， 所述处理器获取的所述第一排序列包括物理列和表达式中的至少一个。 35. The database system of claim 29 or claim 30, wherein said processor obtains said first physical row and column comprises sorting at least one expression. 36. 根据权利要求29或30所述的数据库系统，其特征在于， 所述处理器，还用于在将所述第一数据全部存储至所述底层存储介质中之后，确定查询列，且若所述查询列为所述第一排序列中的第一个排序列，则根据所述第一个排序列，对所述第一数据进行查询操作。 36. The database system of claim 29 or claim 30, wherein the processor is further configured to store the first data to all of the underlying storage medium after the query column is determined, and if sort the query as a first column of the first row of sorting, the sorting according to said first column, the first query operation data. 37. 根据权利要求36所述的数据库系统，其特征在于， 所述处理器，还用于在确定所述查询列之后，根据所述第一个排序列，对所述第一数据进行查询操作之前，将所述底层存储介质中存储的所述第一数据读入所述内存中，并根据所述第一个排序列，在所述内存中采用二分查找方式对所述第一数据的一个或多个数据页中的每个数据页进行查询操作。 37. The database system according to claim 36, wherein the processor is further configured to, after determining that the query column, a sorting according to said first column, the first query operation data before the bottom of the storage medium is read into a first data stored in said memory, and a sorting based on the first column, using a binary search mode the first data in said memory one or more data pages for each data page query. 38. 根据权利要求29或30所述的数据库系统，其特征在于， 所述处理器，还用于在将所述第一数据全部存储至所述底层存储介质中之后，获取第二排序列，且若所述第二排序列为所述第一排序列中的第一个排序列，则根据所述第一个排序列，对所述第一数据进行排序操作。 38. The database system of claim 29 or claim 30, wherein the processor is further configured to, after all of the data stored in said first storage medium underlying obtain a second sort column, and if the second sorting as a first sorting the first column of the sorted column, the column according to the first sort, the sorting operation for the first data. 39. 根据权利要求38所述的数据库系统，其特征在于， 所述处理器，还用于在获取所述第二排序列之后，根据所述第一个排序列，对所述第一数据进行排序操作之前，将所述底层存储介质中存储的所述第一数据读入所述内存中，并根据所述第一个排序列，在所述内存中对所述第一数据进行归并排序。 39. The database system according to claim 38, wherein the processor is further configured to, after acquiring the second sort column, a sorting according to said first column of said first data before the sorting operation, the bottom layer of the storage medium is read into a first data stored in said memory, and a sorting based on the first column, a merge sort of data in said first memory. 40. 根据权利要求29或30所述的数据库系统，其特征在于， 所述处理器，还用于在将所述第一数据全部存储至所述底层存储介质中之后，确定聚合列，且若所述聚合列为所述第一排序列中的第一个排序列，则根据所述第一个排序列，对所述第一数据进行聚合操作，所述聚合操作为在所述第一数据中查找最大值或最小值的操作。 40. The database system of claim 29 or claim 30, wherein the processor is further configured to store the first data to all of the underlying storage medium after the polymerization column is determined, and if the polymerization sorting as a first sorting of the first column in the column, the column according to the first sort, the first operation data polymerization, the polymerization operation as the first data Find the maximum or minimum operations. 41. 根据权利要求40所述的数据库系统，其特征在于， 所述处理器，还用于在确定所述聚合列之后，根据所述第一个排序列，对所述第一数据进行聚合操作之前，将所述底层存储介质中存储的所述第一数据读入所述内存中，并根据所述第一个排序列，在所述内存中确定所述第一数据的一个或多个数据页中的每个数据页中的最大值或最小值，并依次比较所述每个数据页中的最大值或最小值，以确定所述第一数据中的最大值或最小值。 41. A database system according to claim 40, wherein the processor is further configured to determine, after said polymerization column, a sorting according to said first column of said first data aggregation operation before the bottom of the storage medium is read into a first data stored in said memory, and a sorting based on the first column, determining one or more of the first data in the data memory each page data page maximum or minimum, and sequentially comparing each of said maximum or minimum in the data page, to determine the maximum or minimum value of said first data. 42. 根据权利要求29所述的数据库系统，其特征在于， 所述处理器，还用于在将待存储的第一数据一部分一部分的分别缓存至所述内存中之前，在所述底层存储介质中创建数据表，并将排序后的所述第二数据逐行插入所述数据表中，以将排序后的所述第二数据聚簇存储至所述底层存储介质中，所述数据表用于装载所述第一数据。 42. A database system according to claim 29, wherein the processor is further configured to be stored in a first data buffer, respectively prior to a portion of the memory in the underlying storage medium create a data table, the data of the second row and sorted into said data table, to the second sorted data stored in the underlying clustered storage medium, the data table used the loading of the first data.